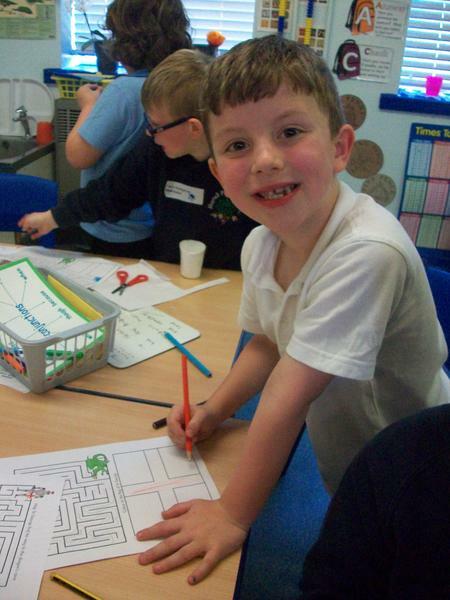 Visit our pages to get an idea of what we do throughout the year! 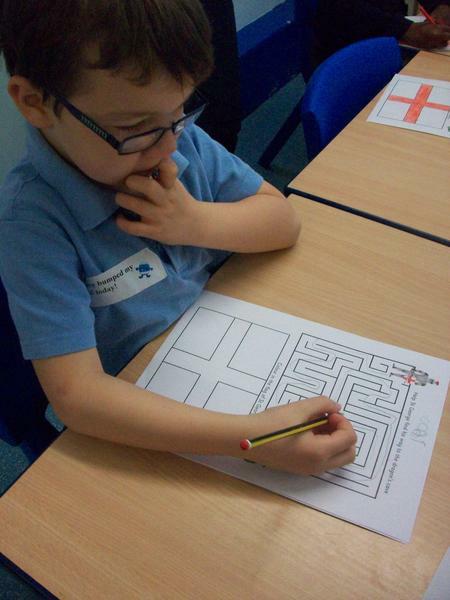 In Year 2 we cover all the foundation subjects (geography, history, art, design & technology,) through a series of learning challenges. 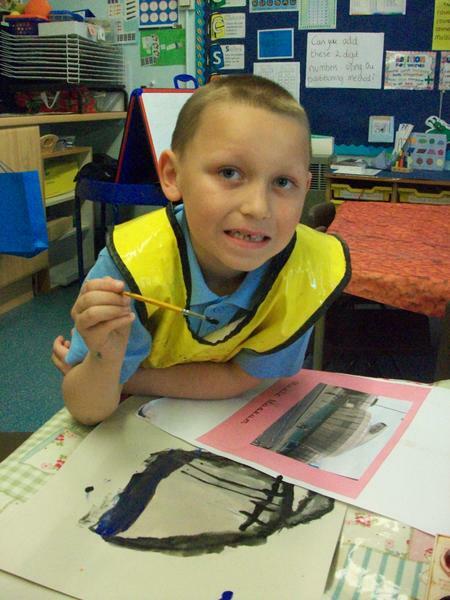 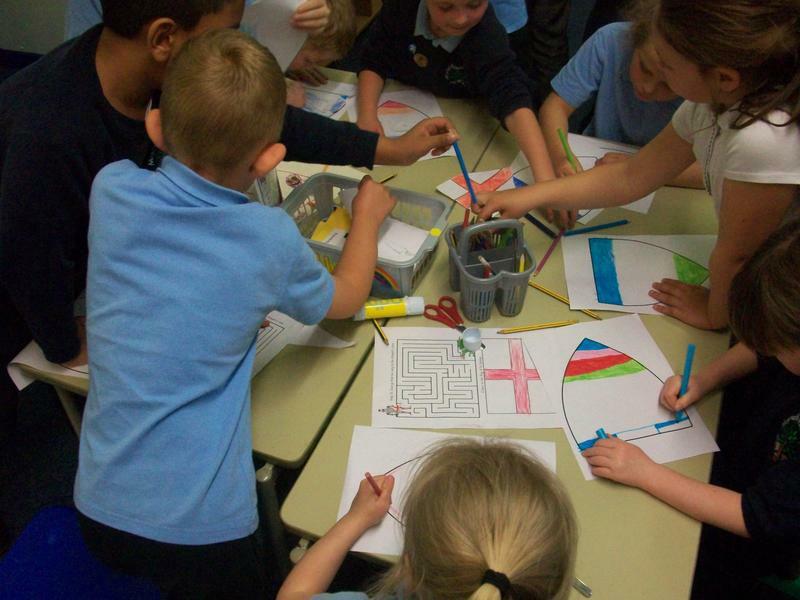 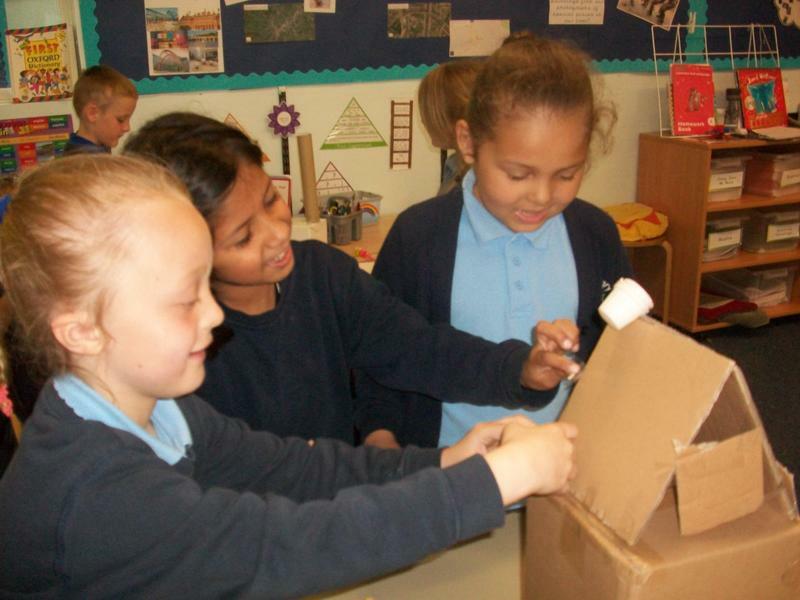 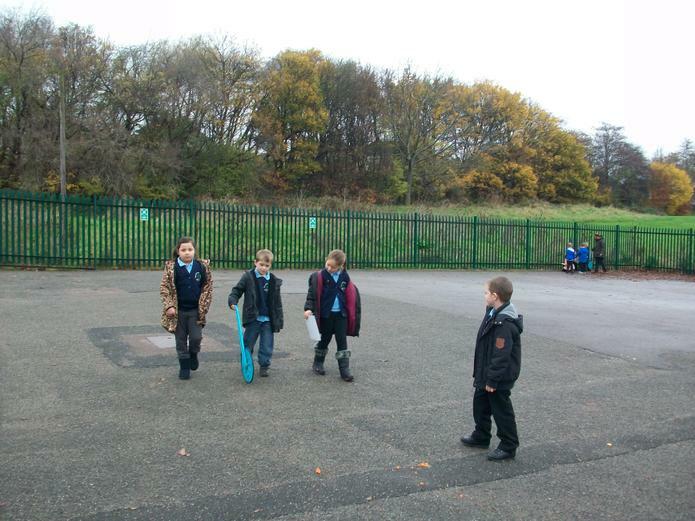 In Year 2, we have been looking at different buildings in Sheffield. 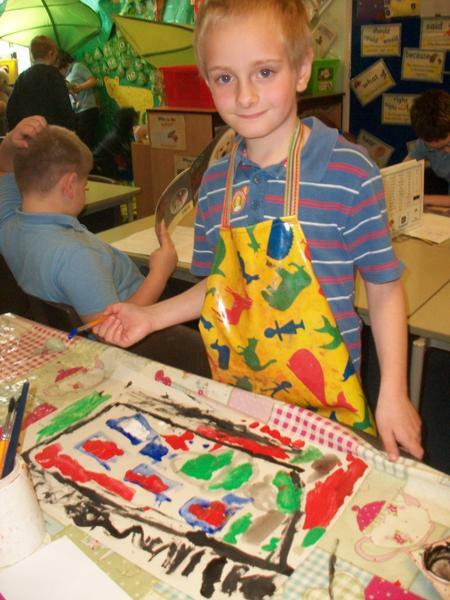 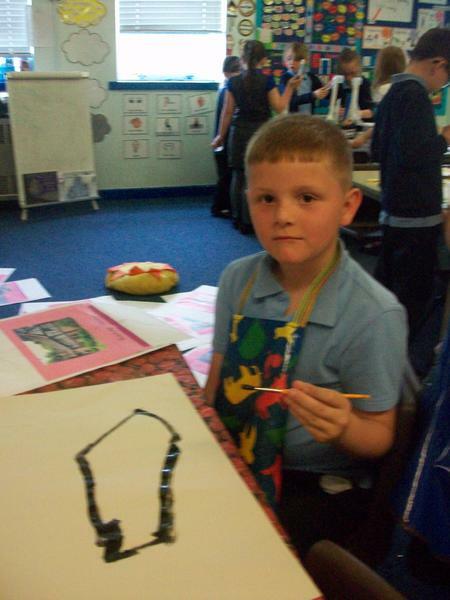 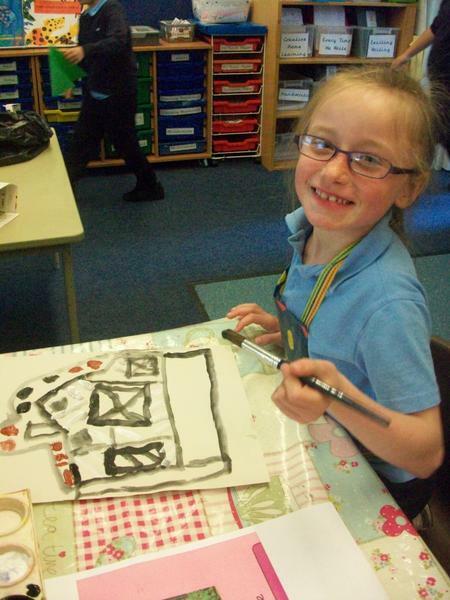 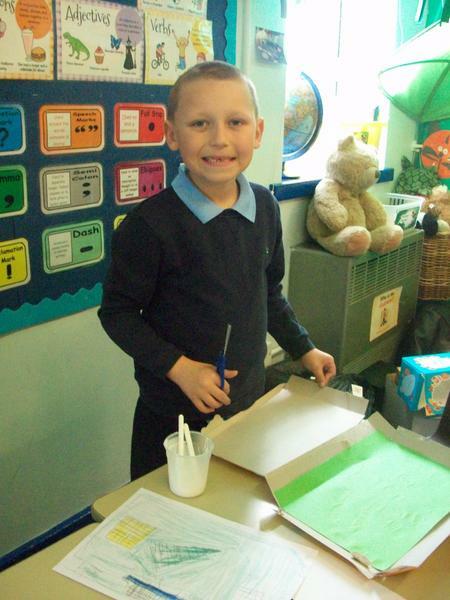 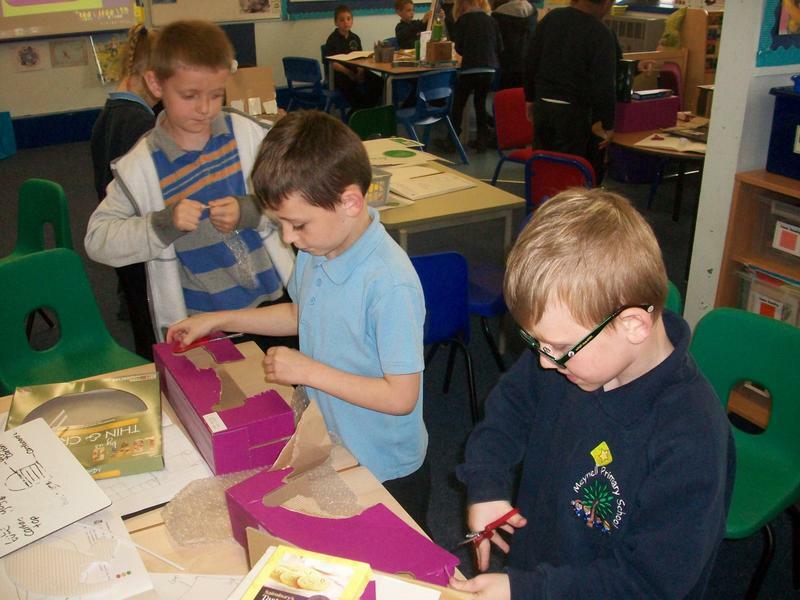 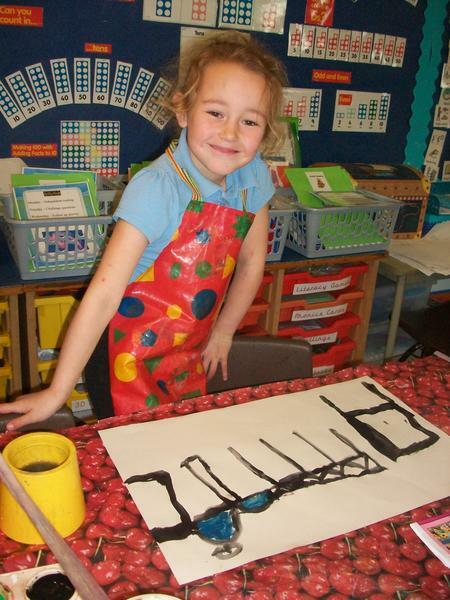 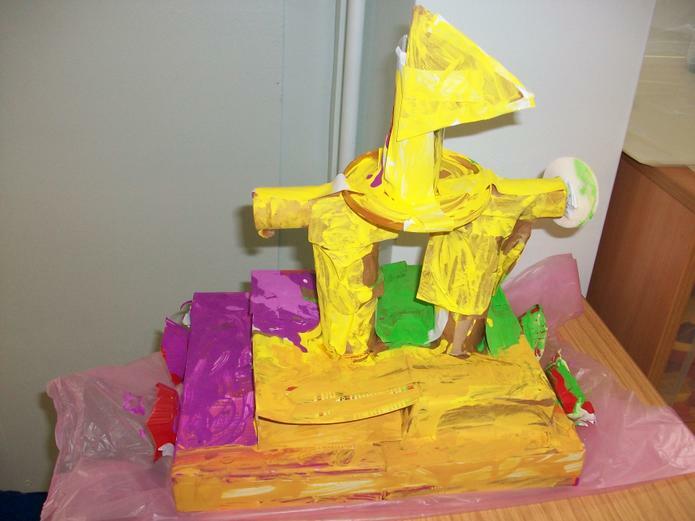 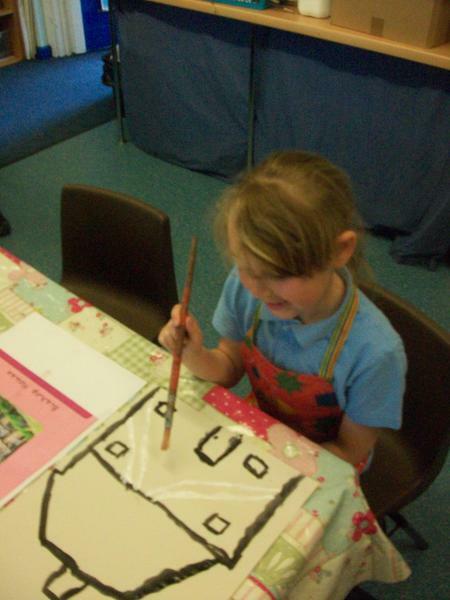 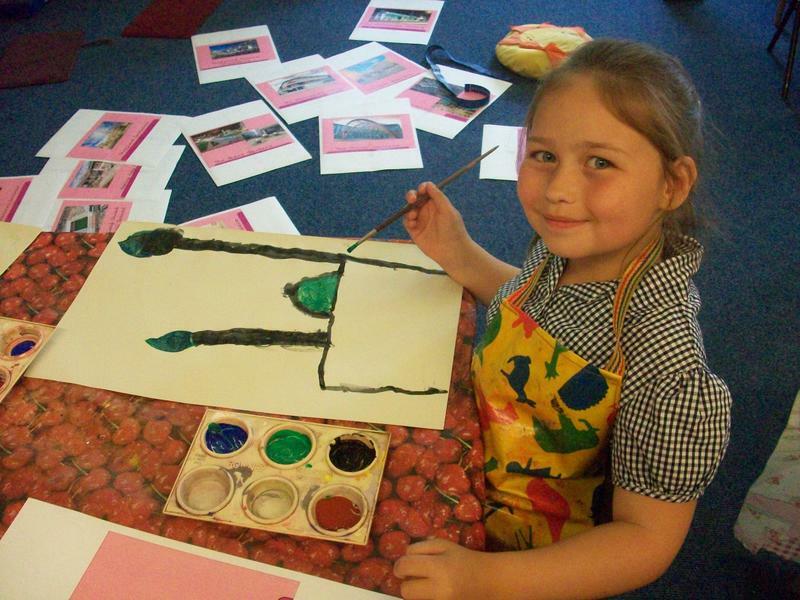 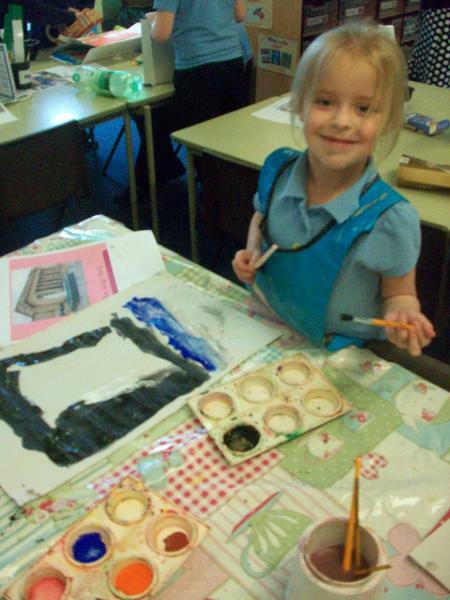 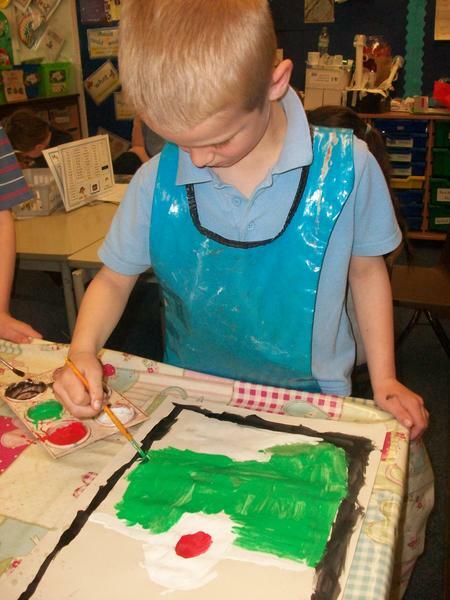 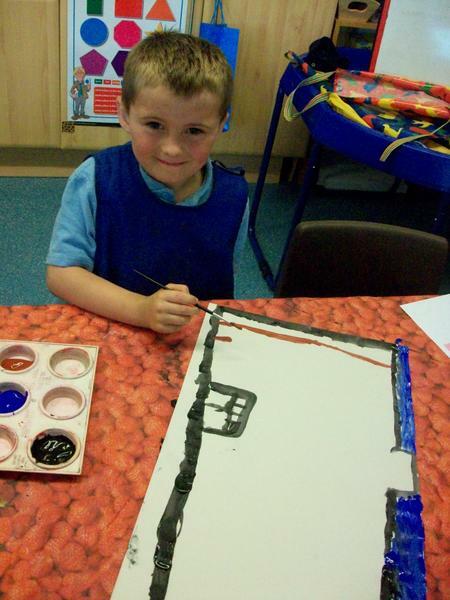 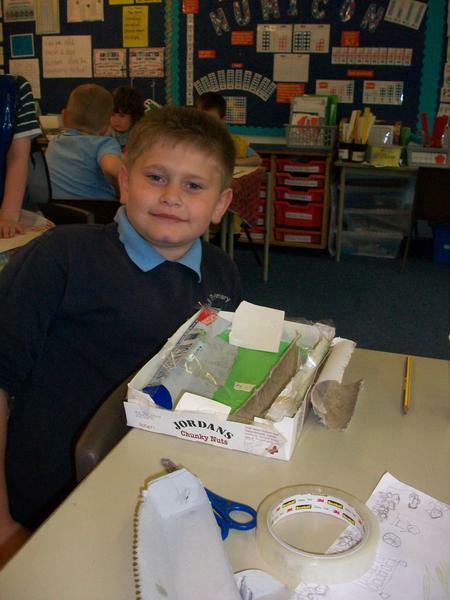 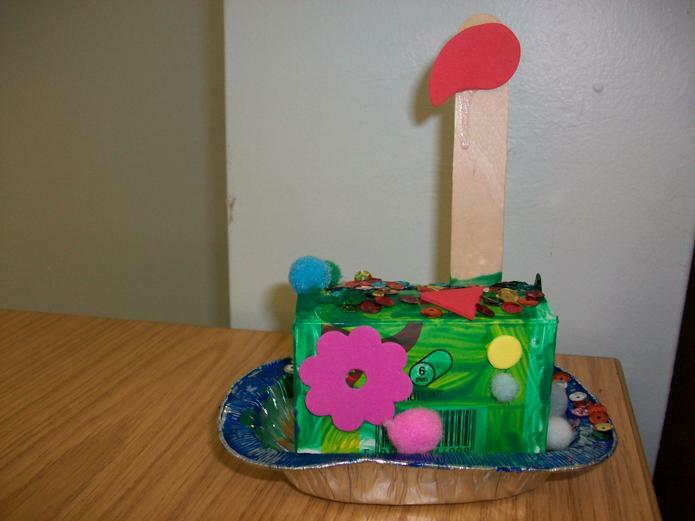 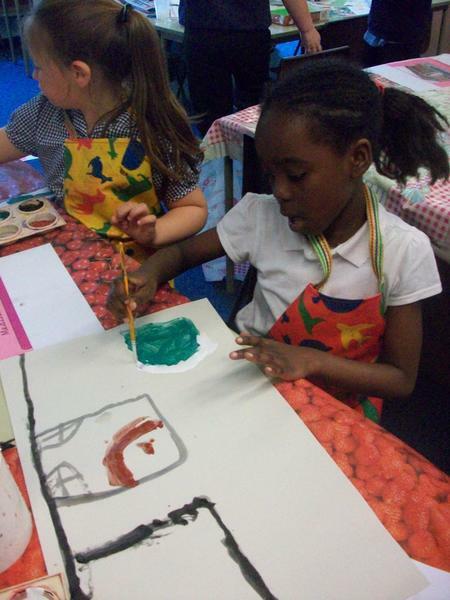 We have created our own paintings and models of the buildings. 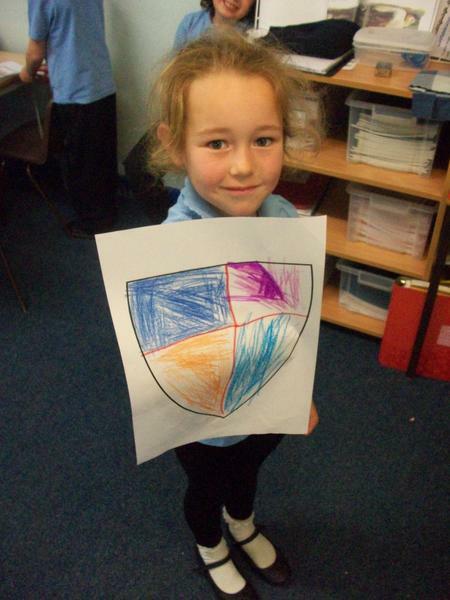 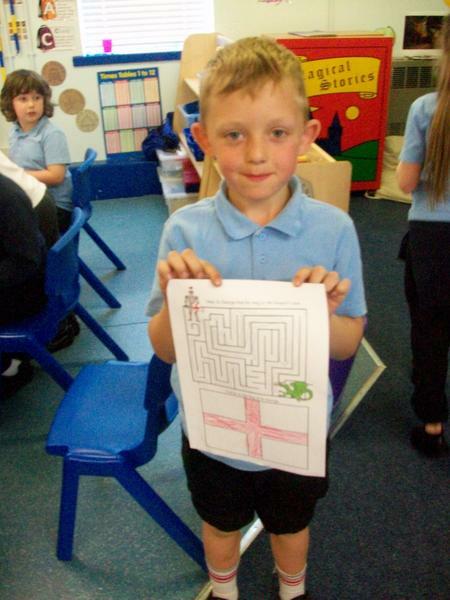 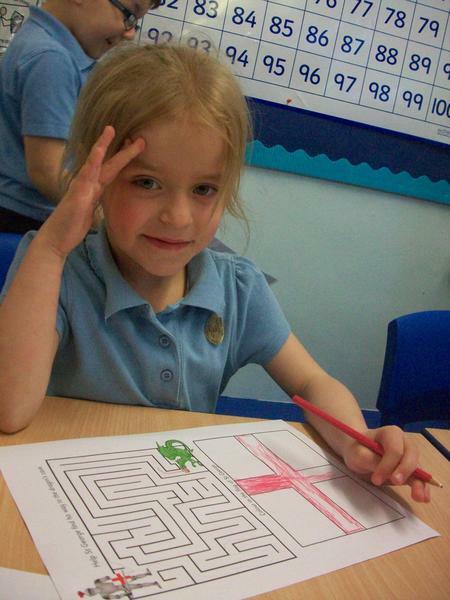 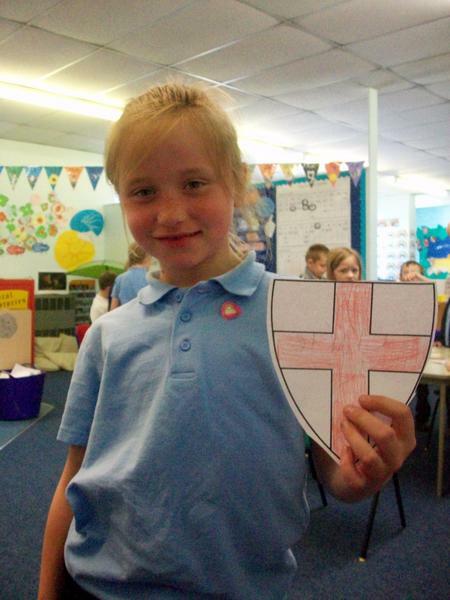 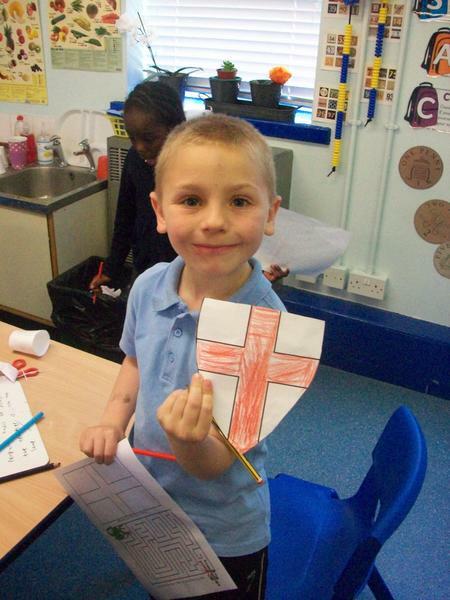 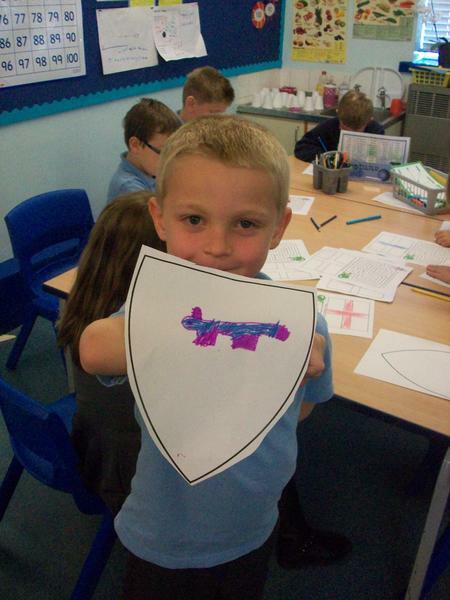 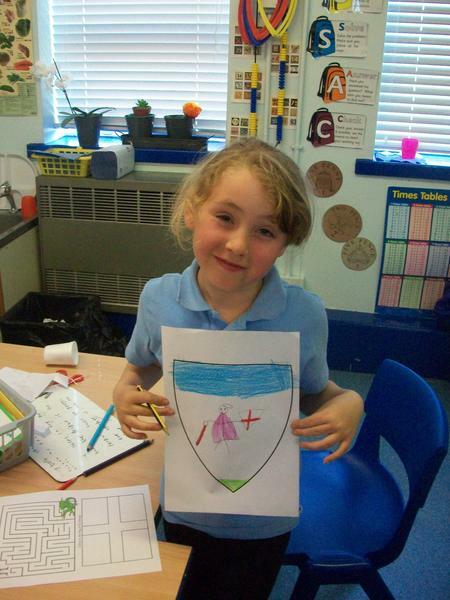 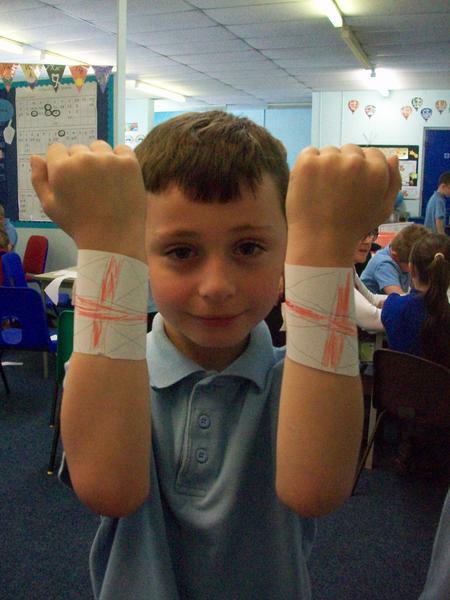 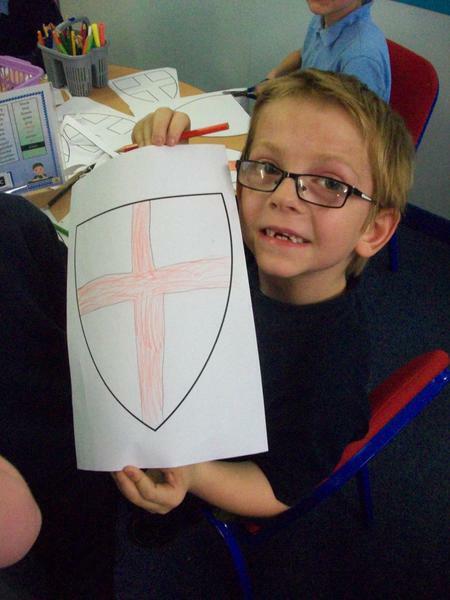 We have been learning about who St George was and what happens on St George's Day! 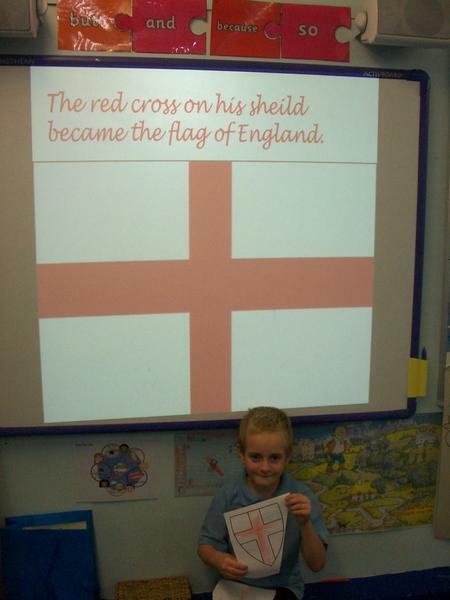 In Year 2, we have been using Pie Corbett to help us with our writing, especially looking at connectives. 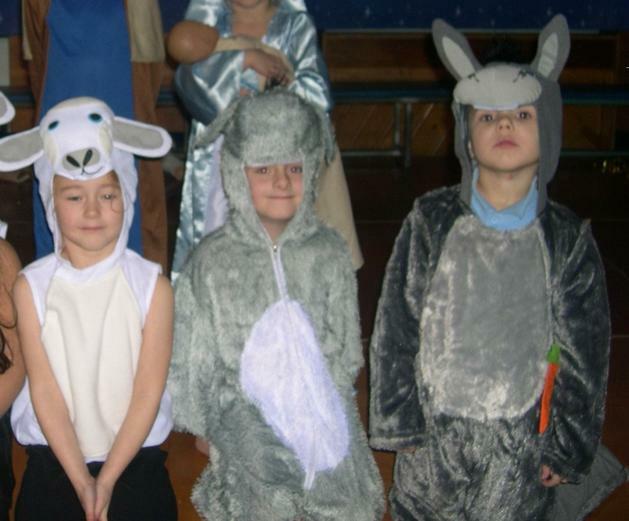 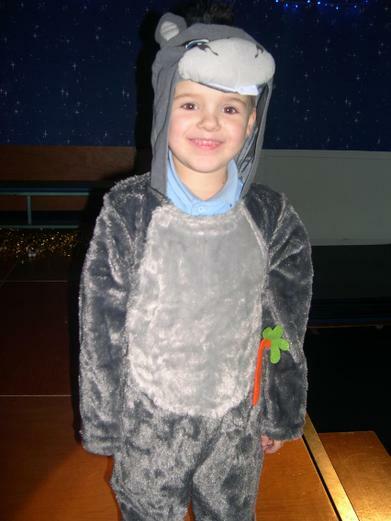 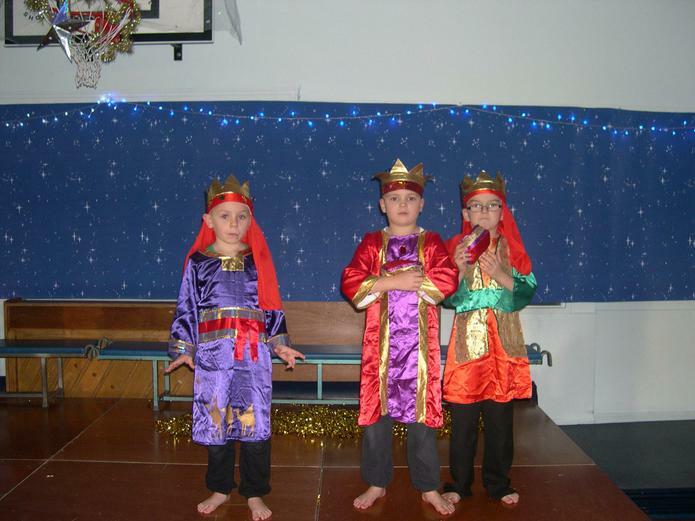 We performed our stories for parents and Key Stage 1 in assembly. 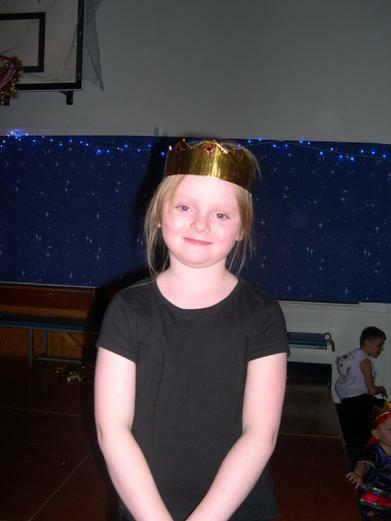 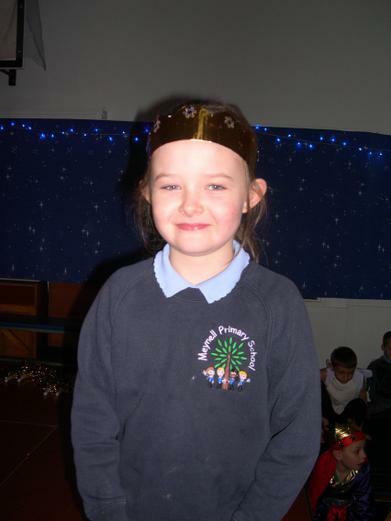 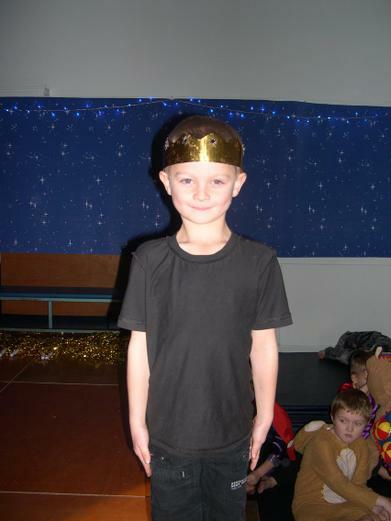 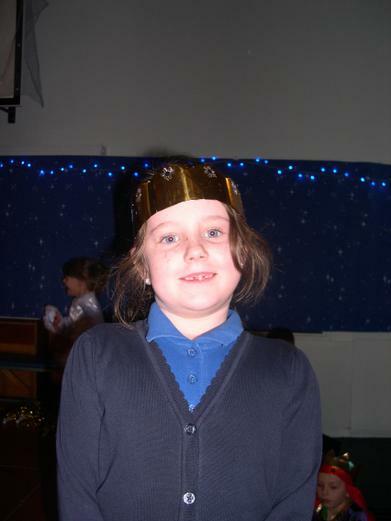 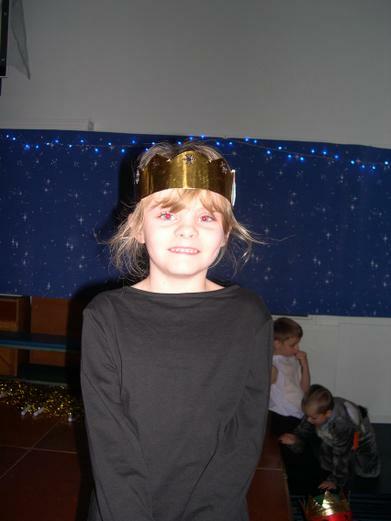 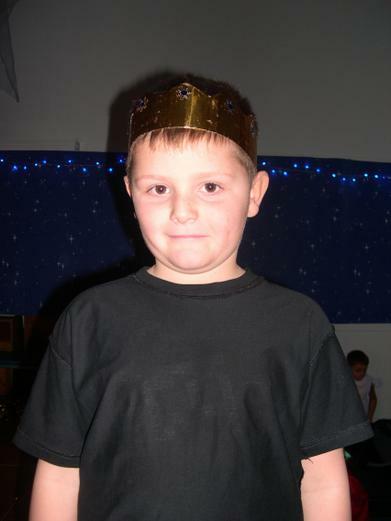 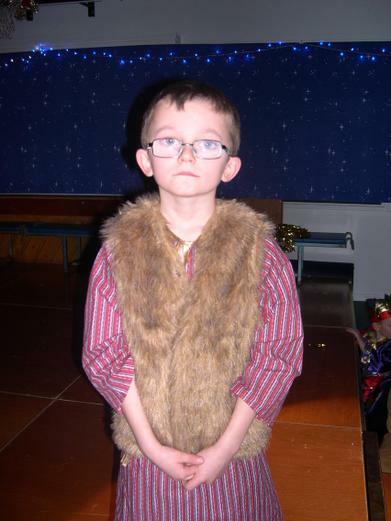 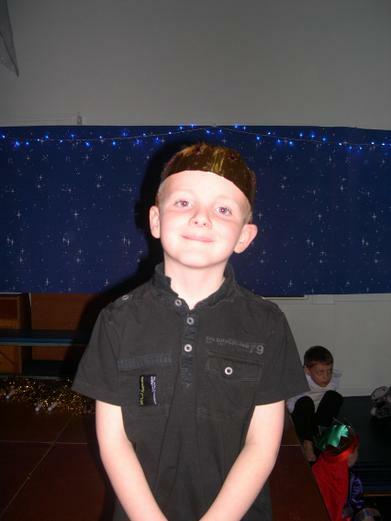 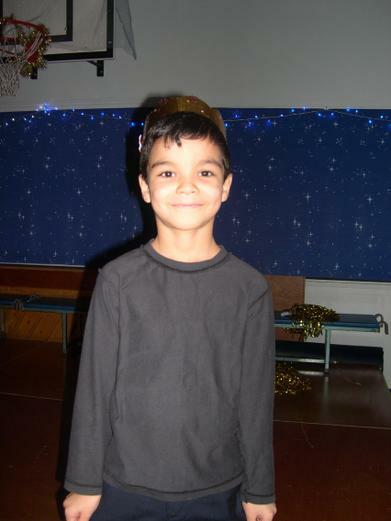 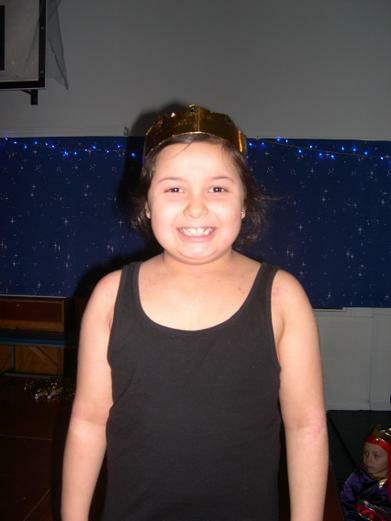 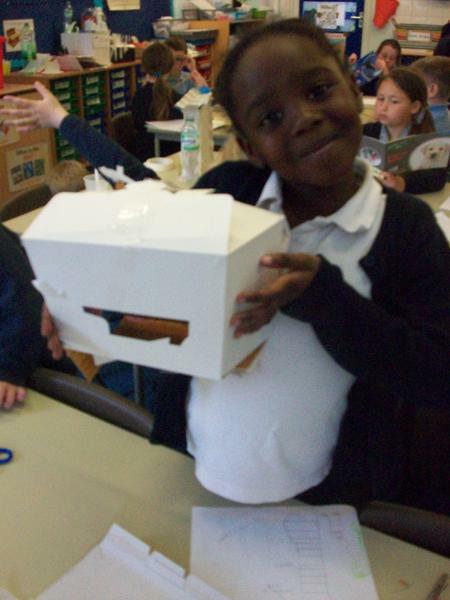 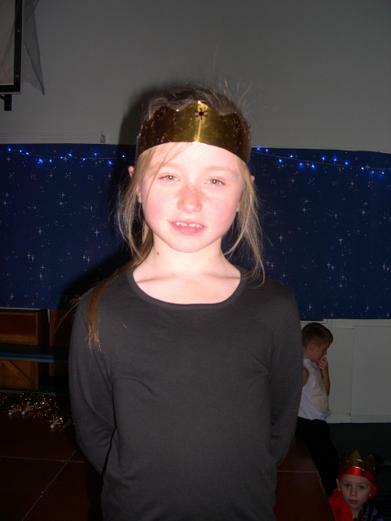 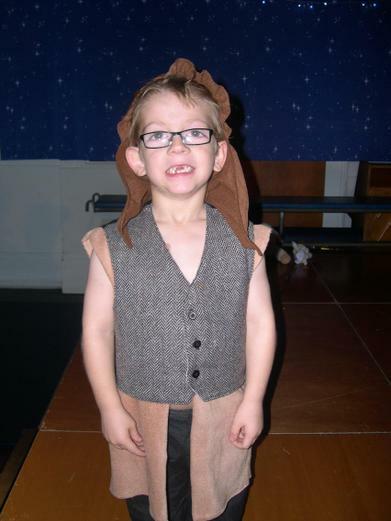 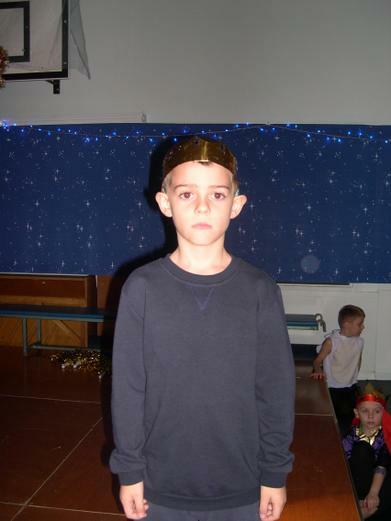 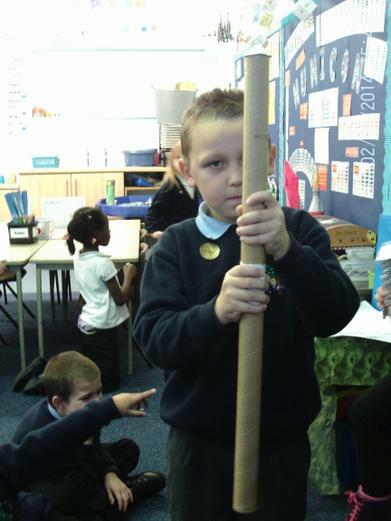 These pictures show the children performing the fairy tale Rumplestiltskin. 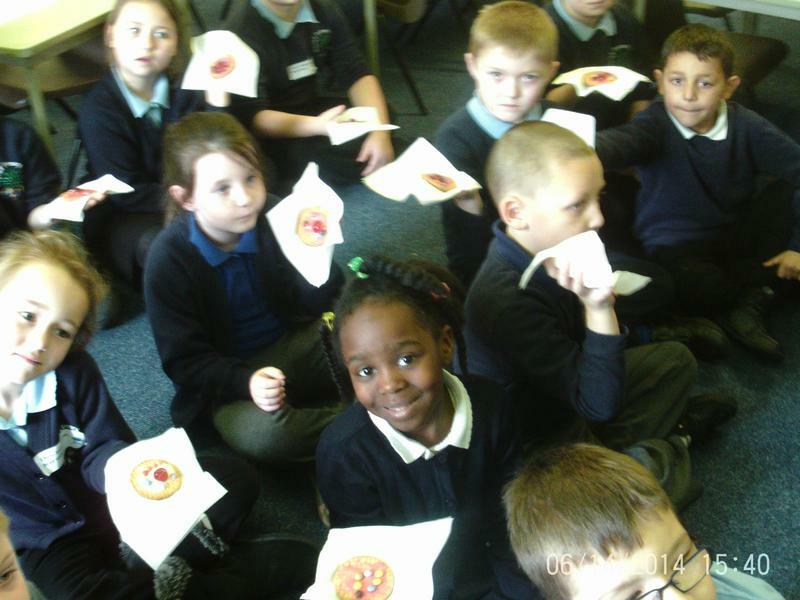 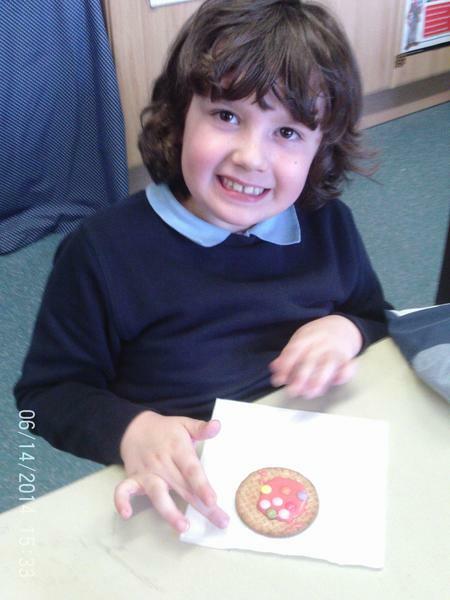 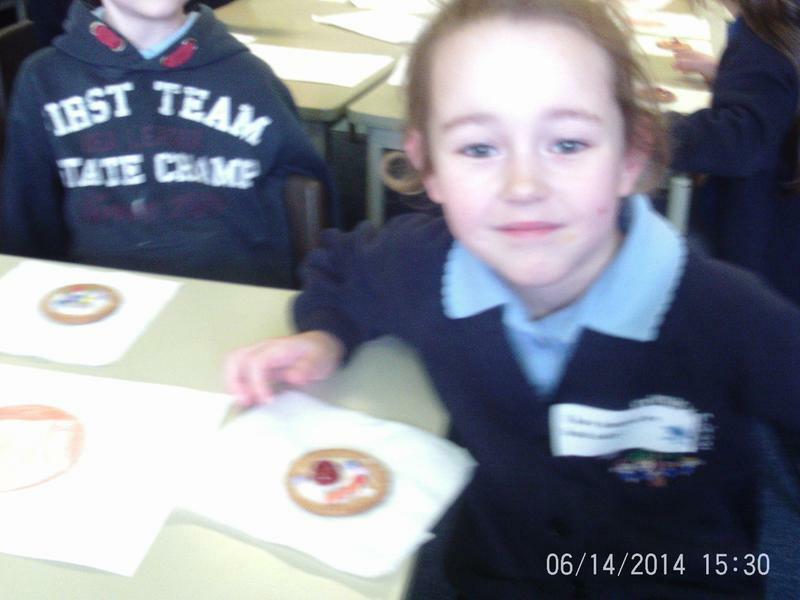 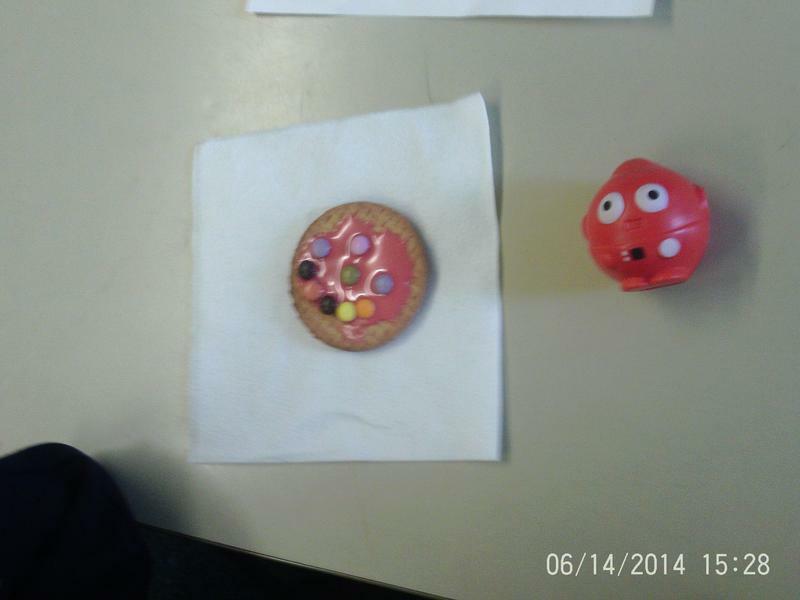 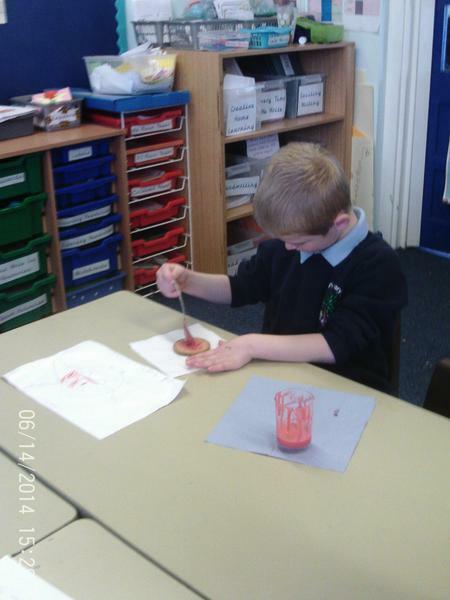 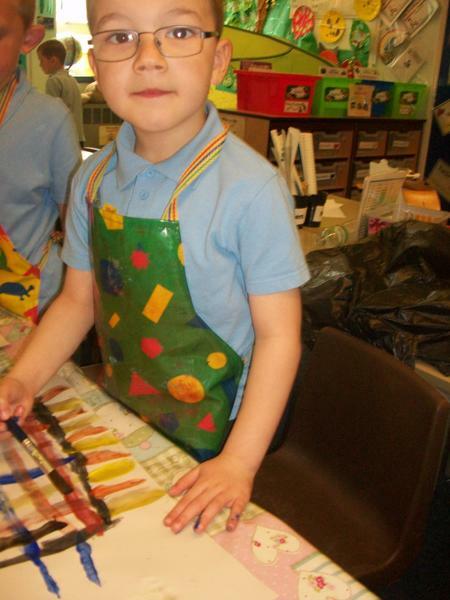 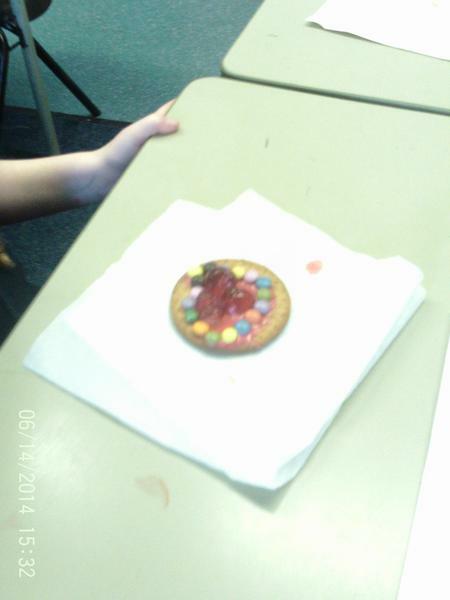 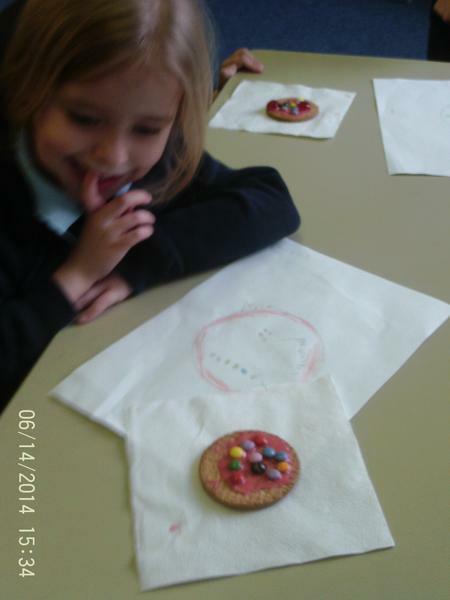 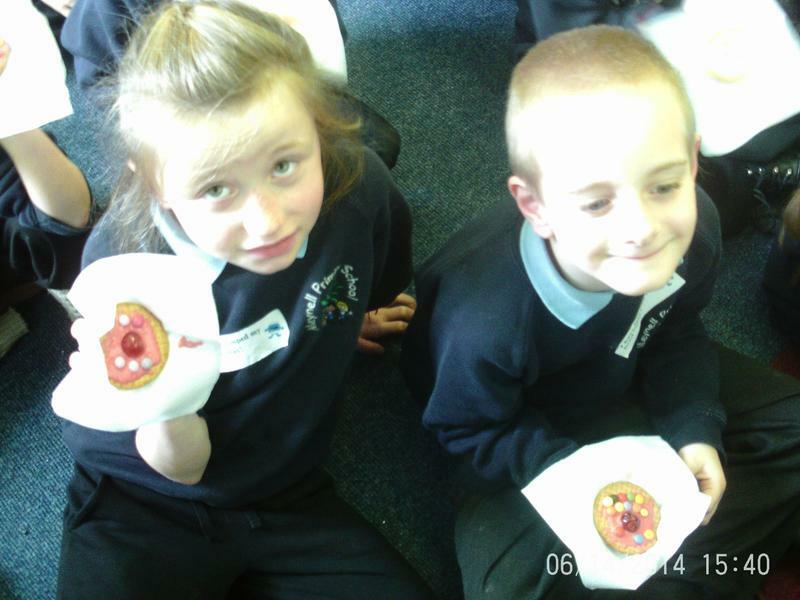 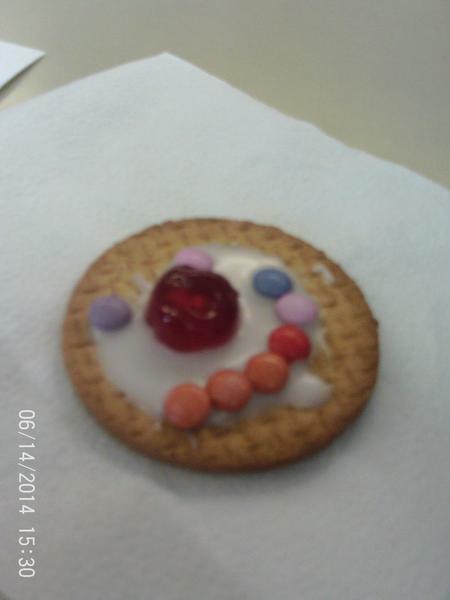 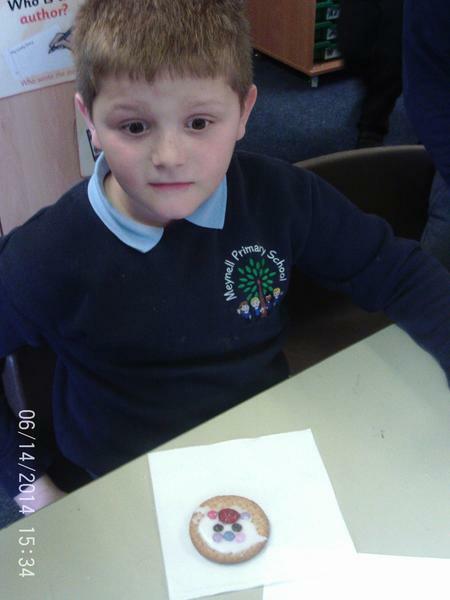 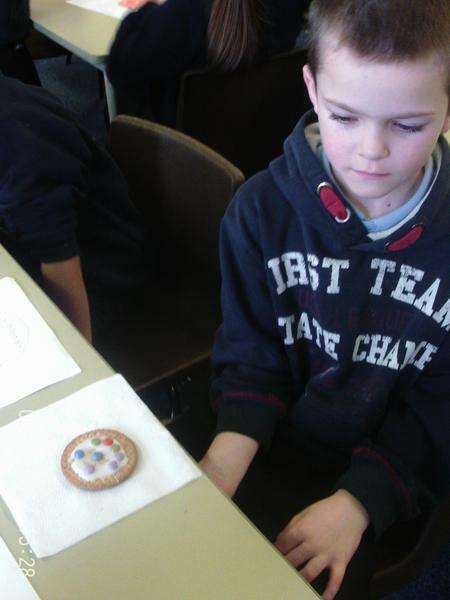 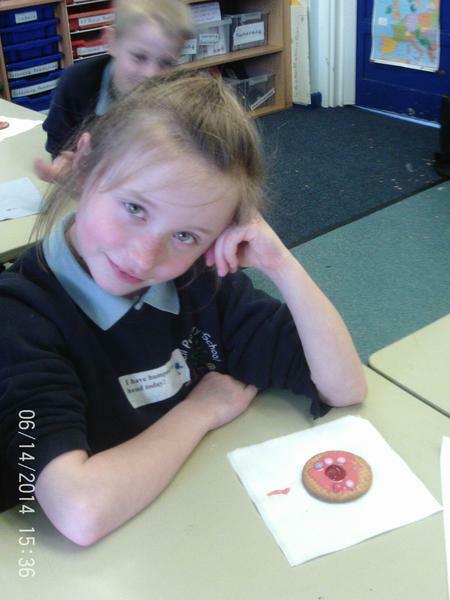 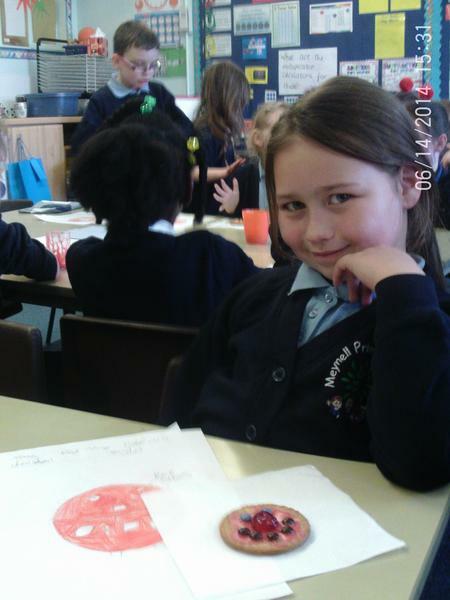 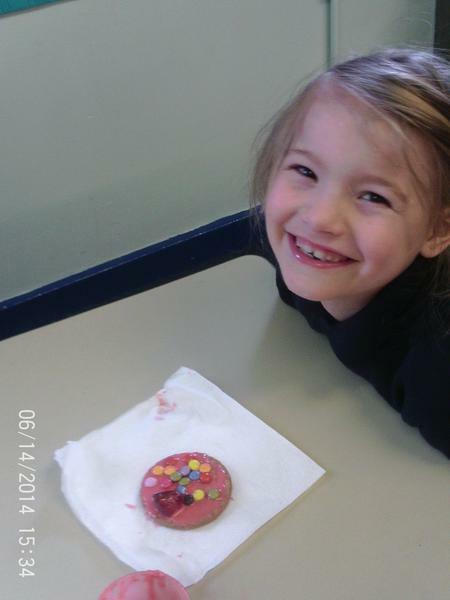 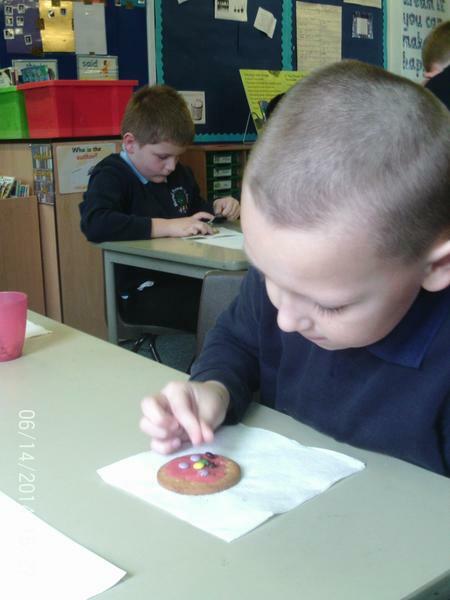 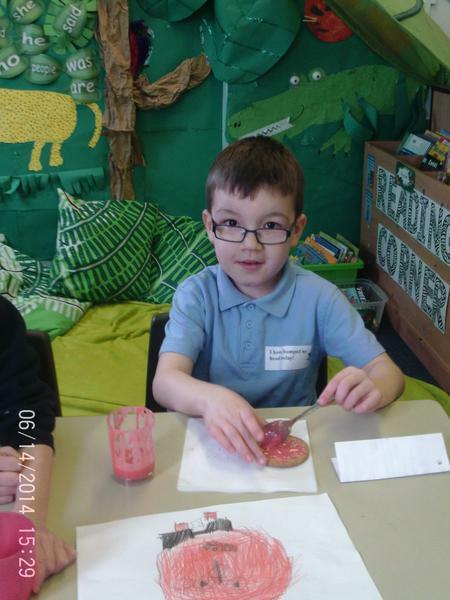 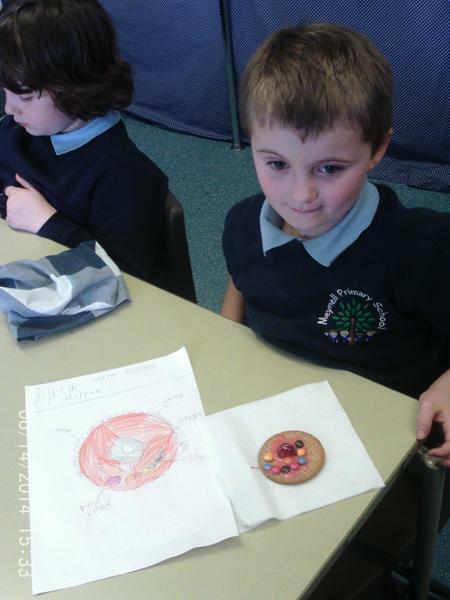 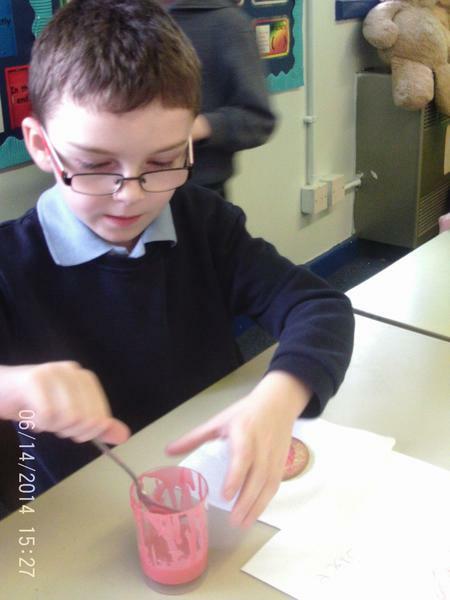 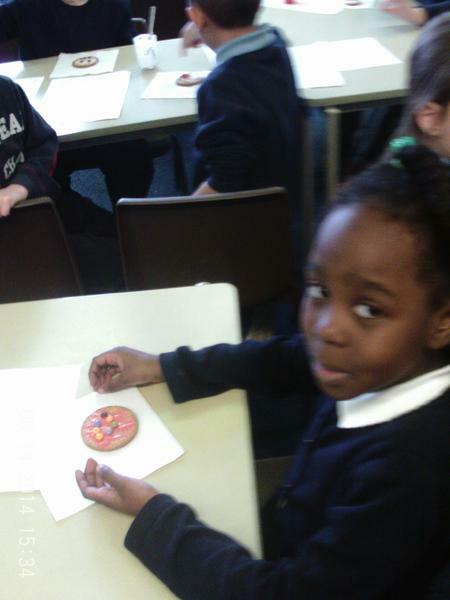 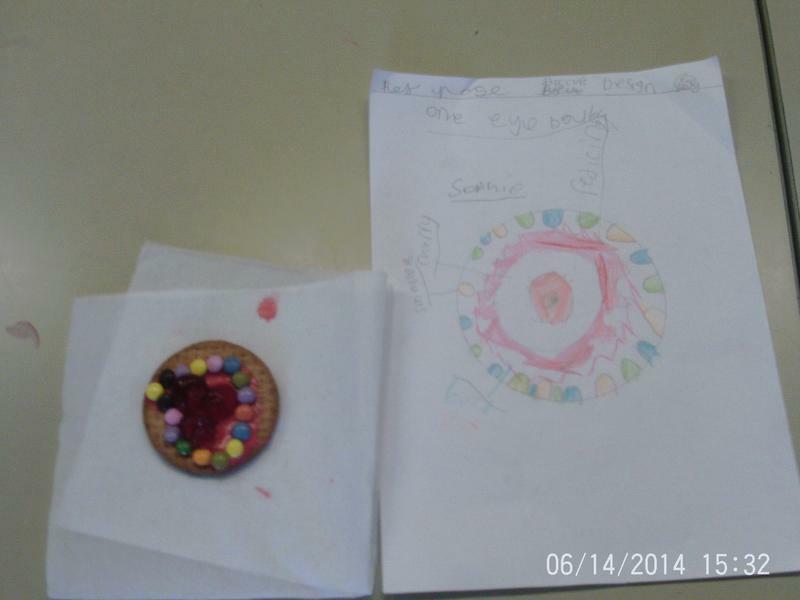 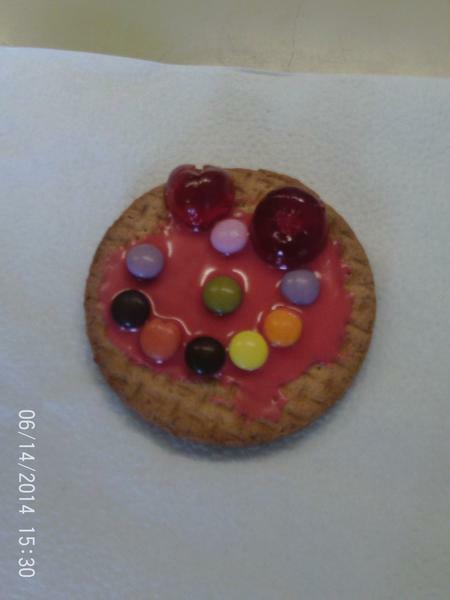 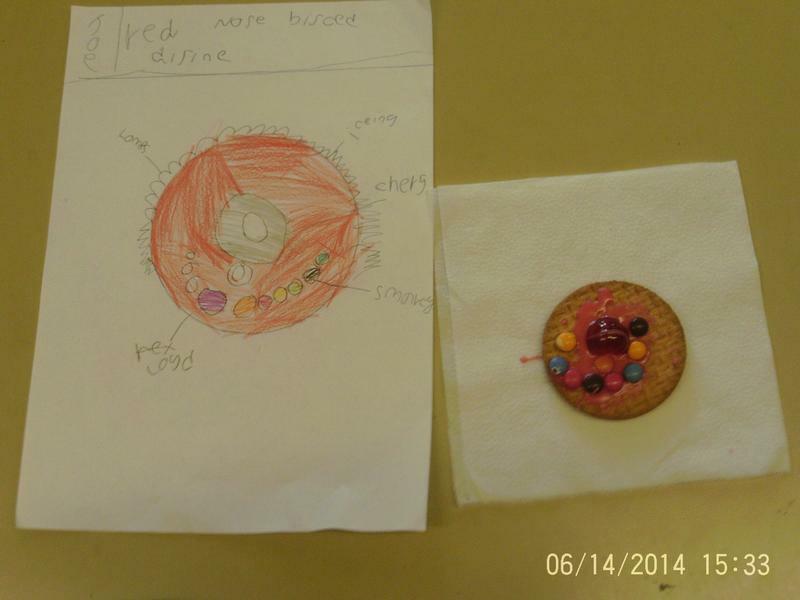 In Year 2, we celebrated Red Nose Day by wearing red noses and designing and making Red Nose Day biscuits! 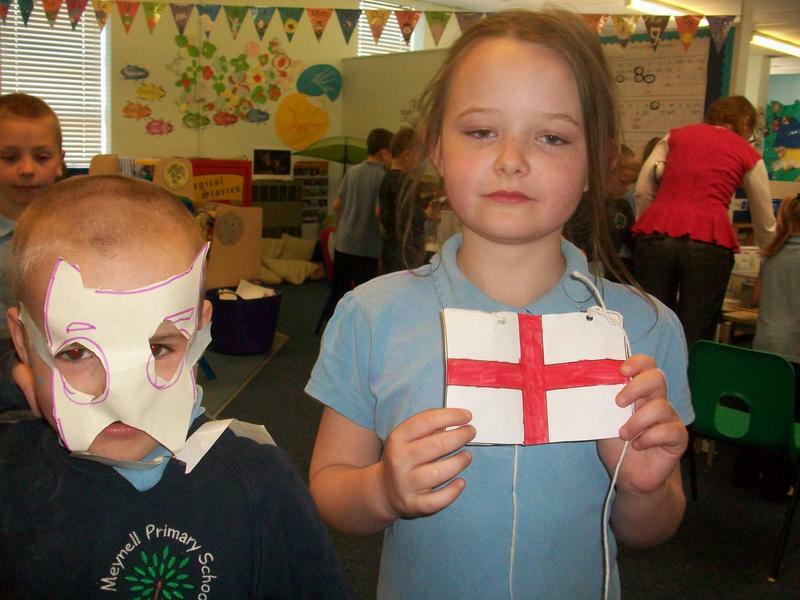 We dressed up to celebrate World Book Day and talked about our favourite books. 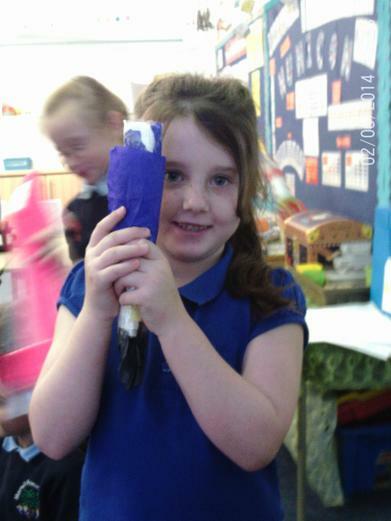 To round off our topic about Africa, we had a chance to play real African drums alongside our African animal dance that we have been developing. 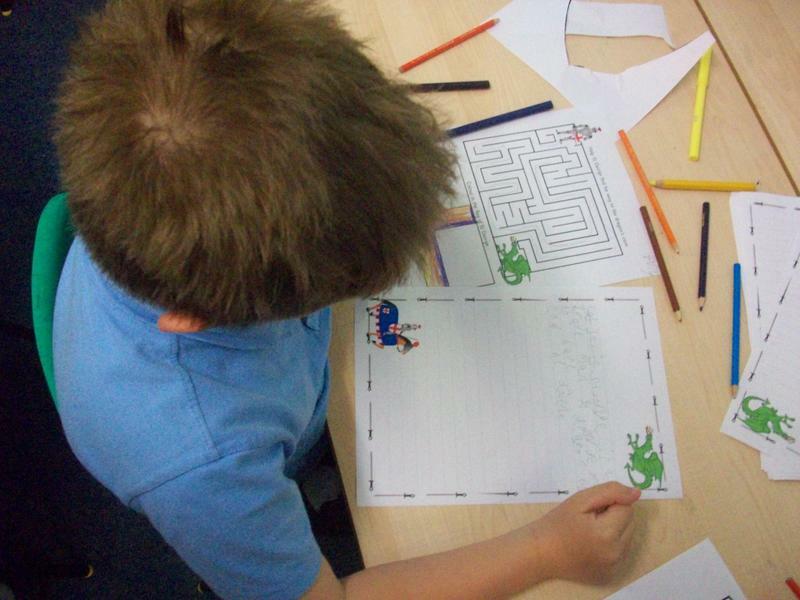 In Year 2, we have been using Pie Corbett to help us with our writing, especially looking at connectives. 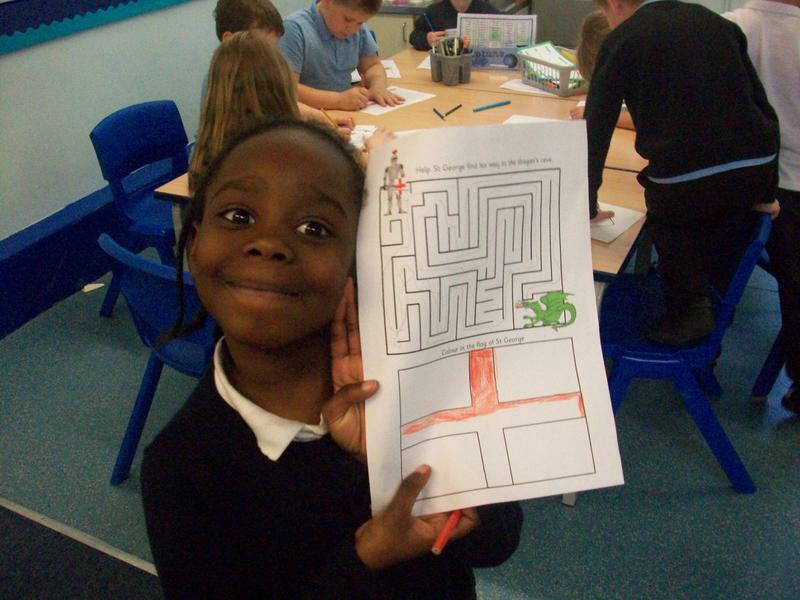 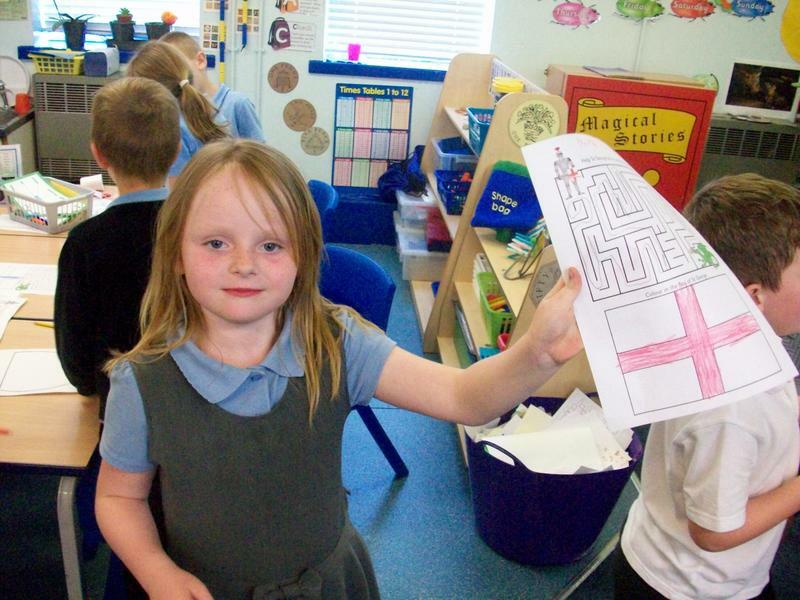 We learnt stories by creating story maps and using actions suggested by Pie Corbett. 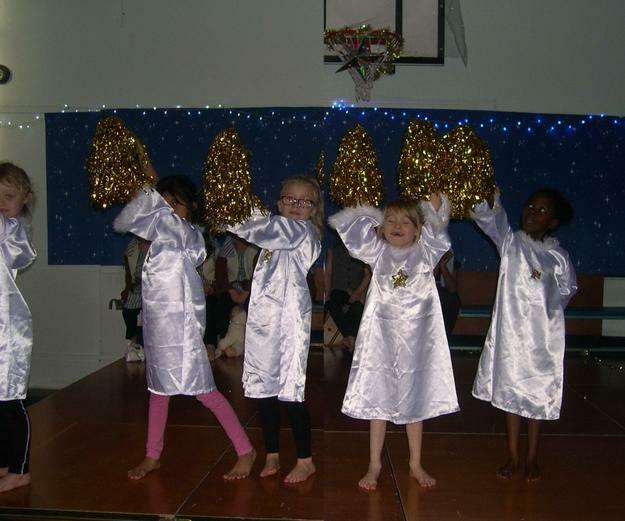 We performed our stories for parents and Key Stage 1 in assembly. 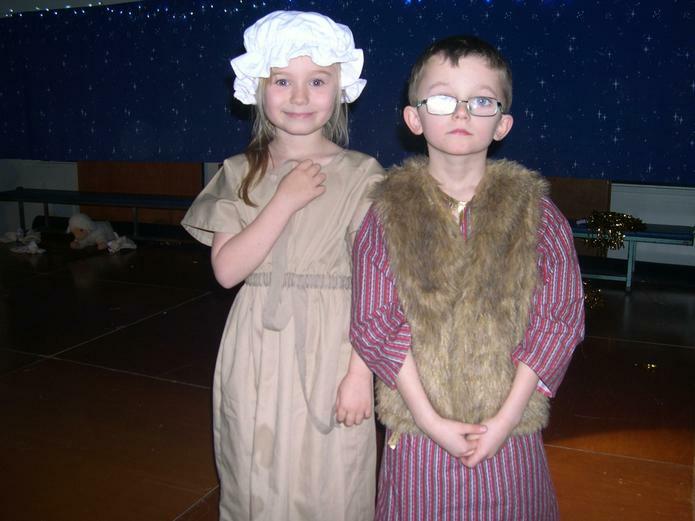 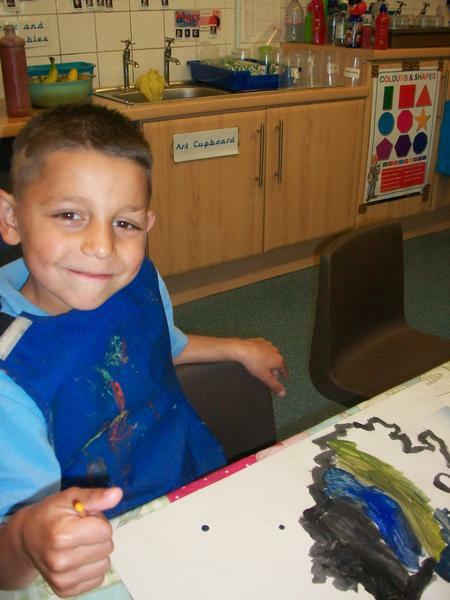 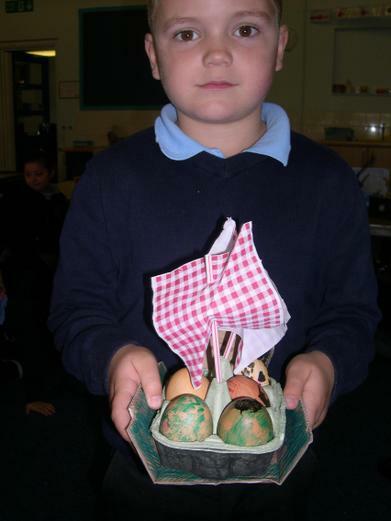 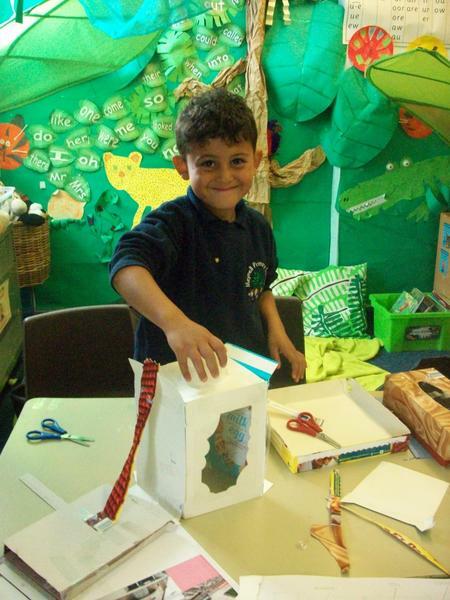 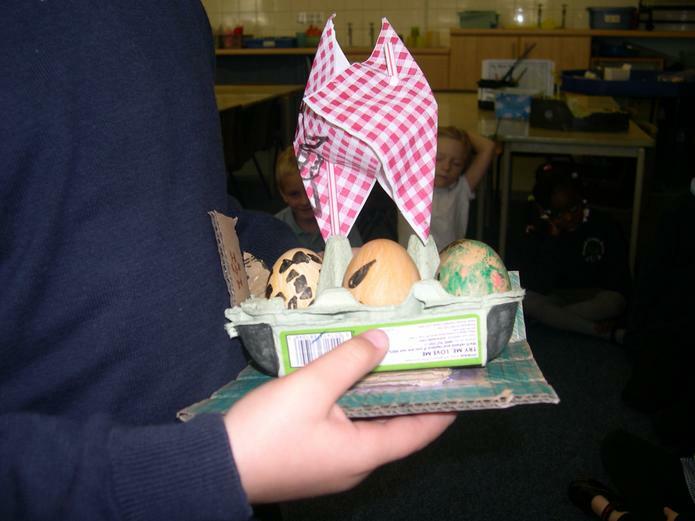 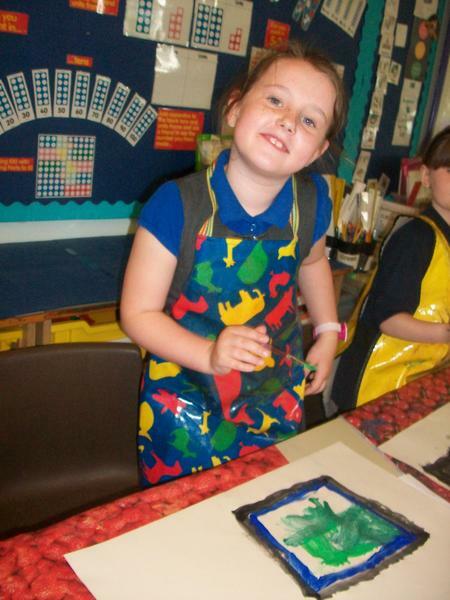 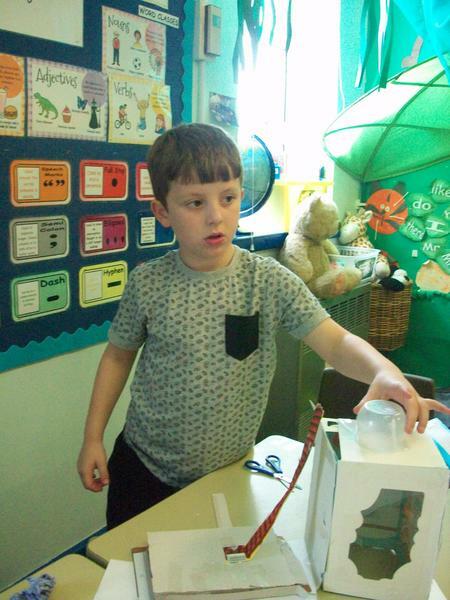 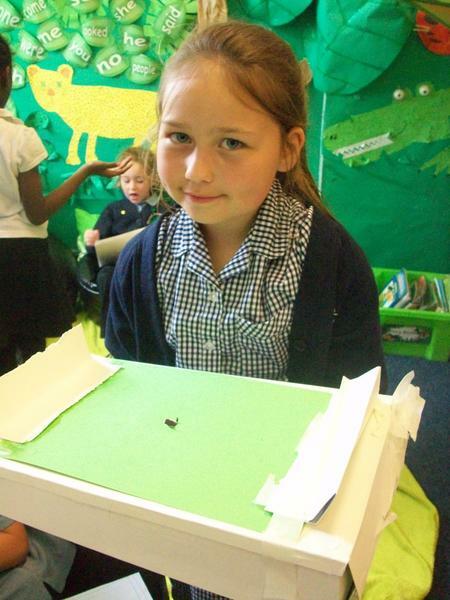 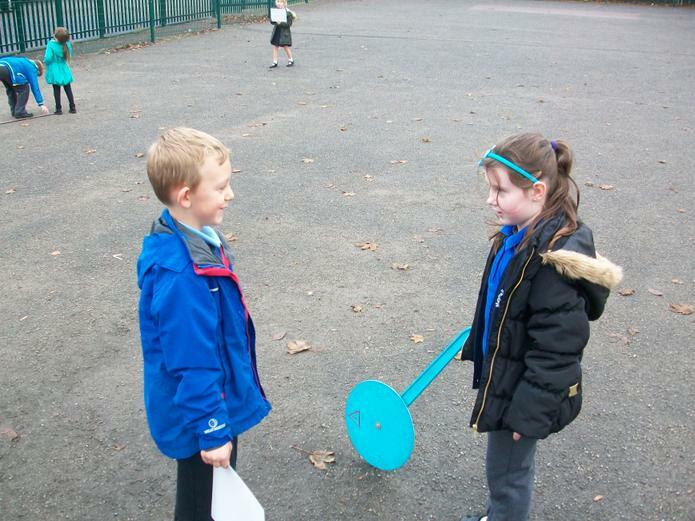 These pictures show the children performing Aesop's fable The Sun and The Wind . 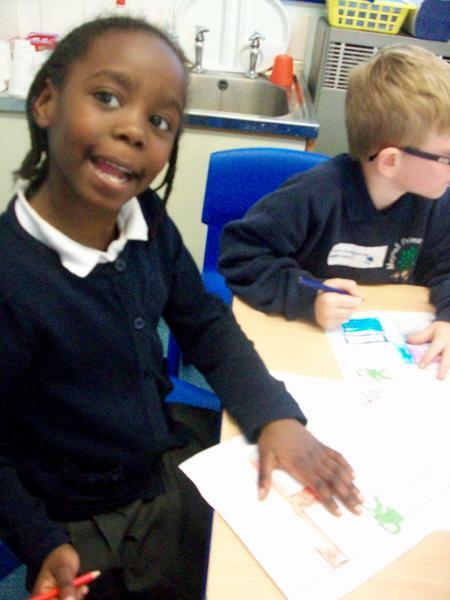 We had a fantastic time on our trip to the library and we enjoyed listening to some Christmas stories. 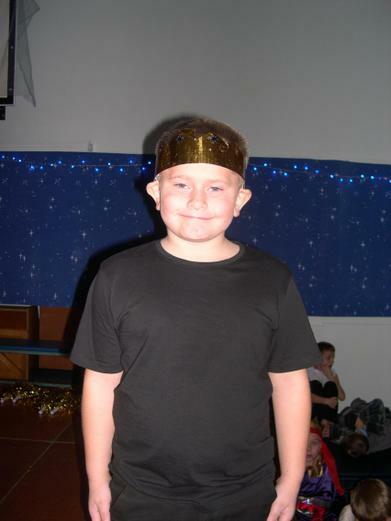 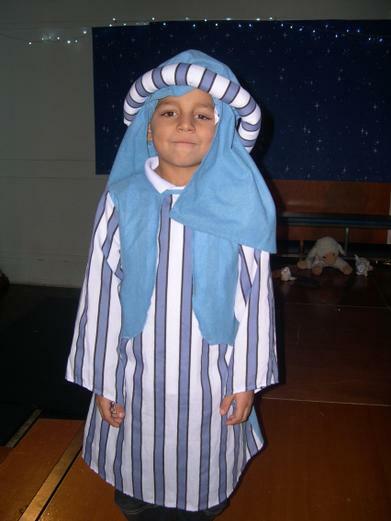 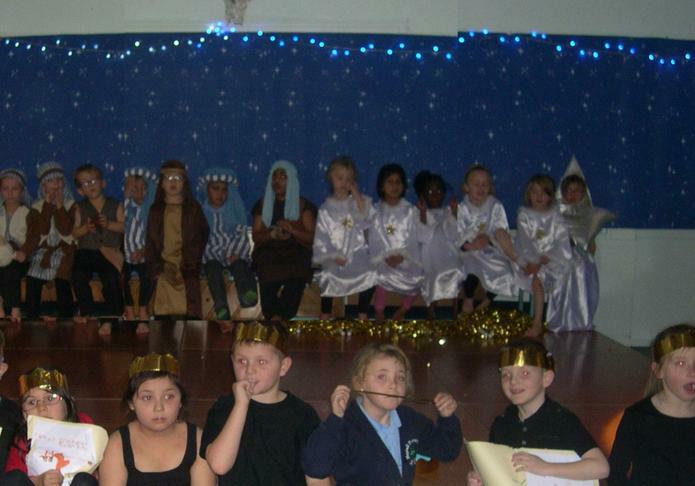 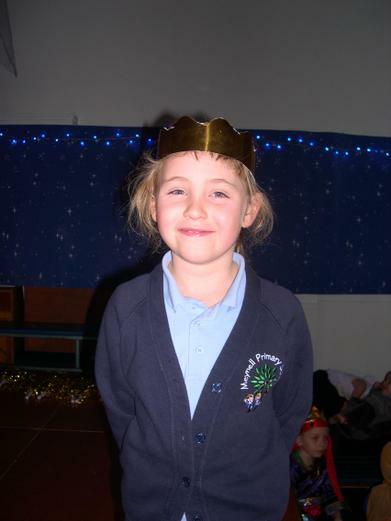 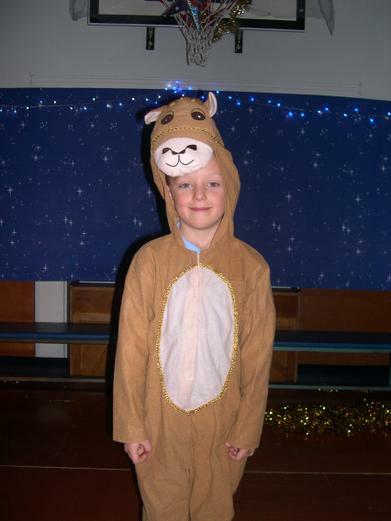 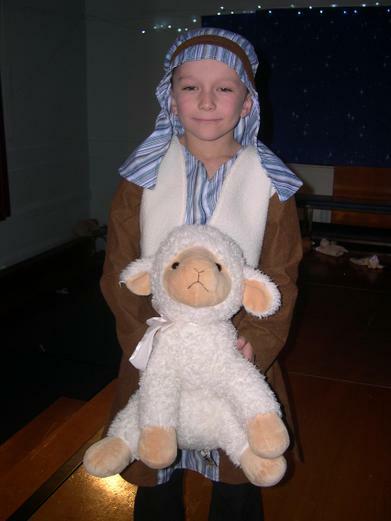 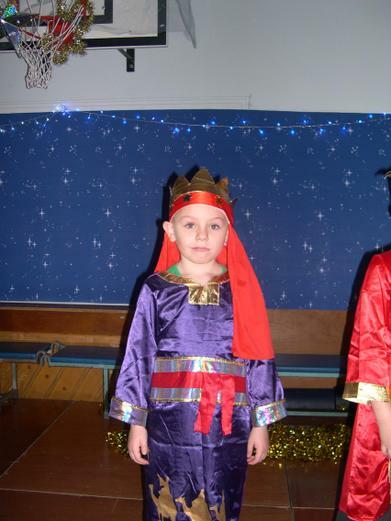 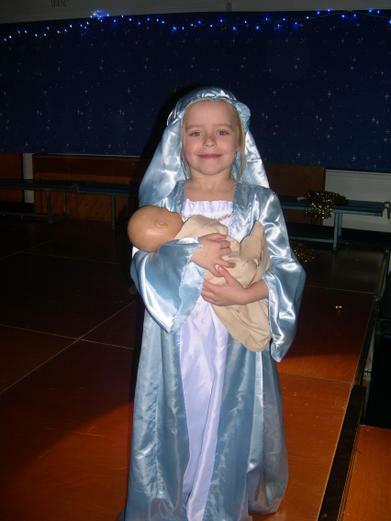 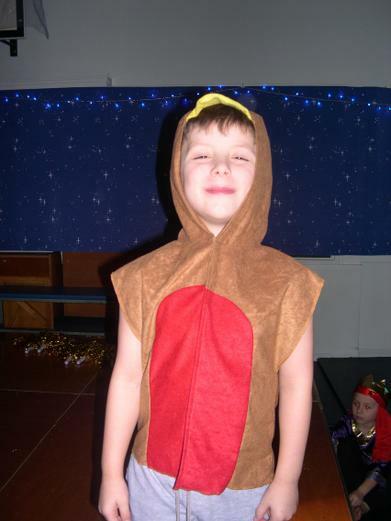 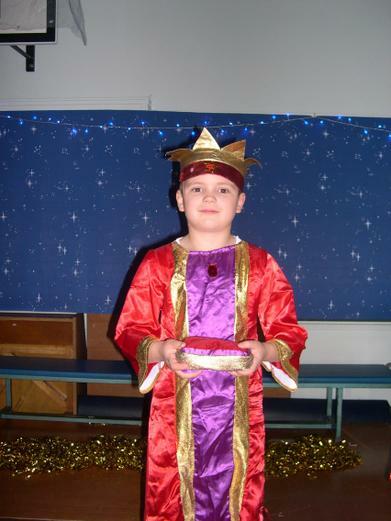 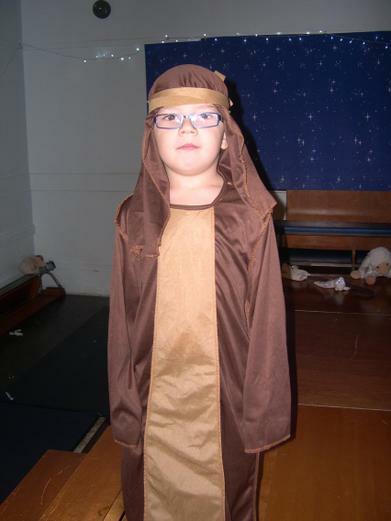 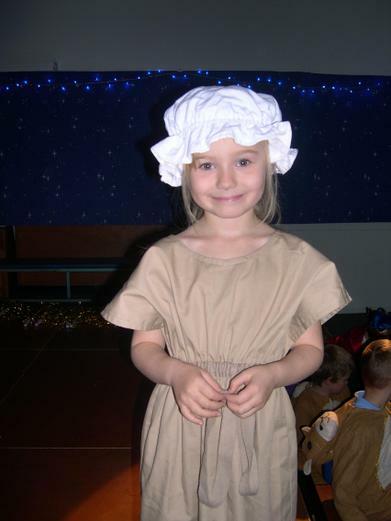 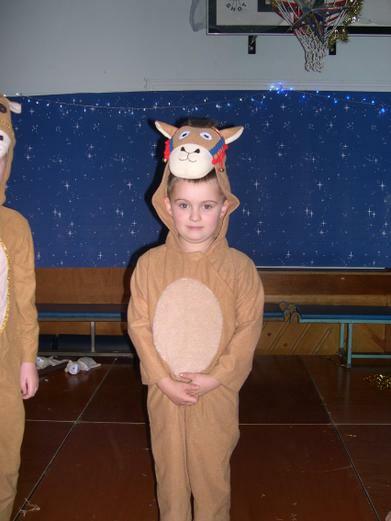 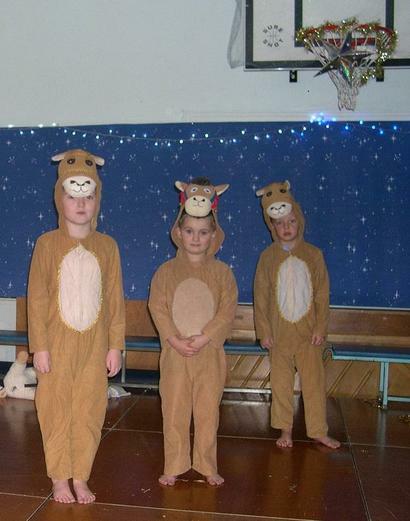 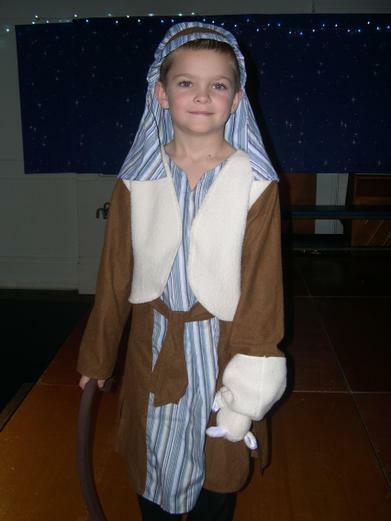 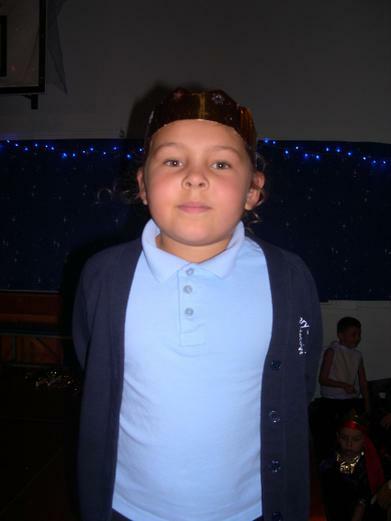 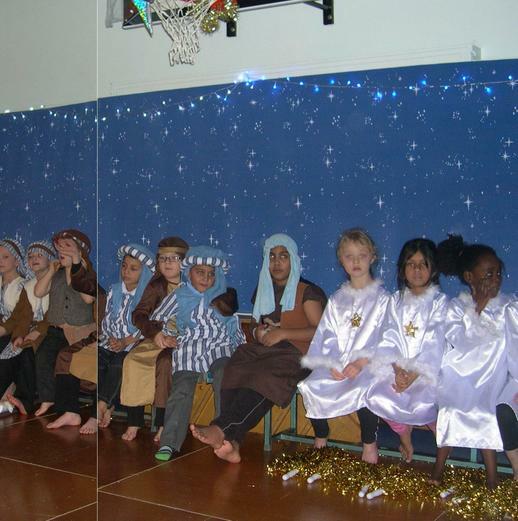 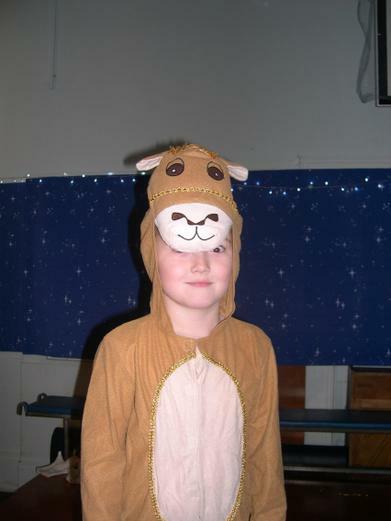 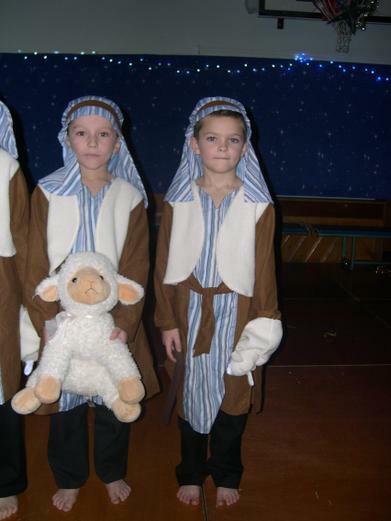 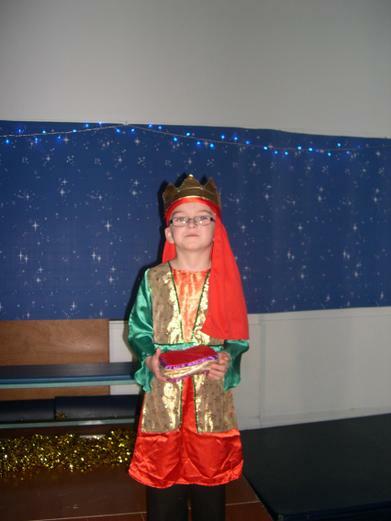 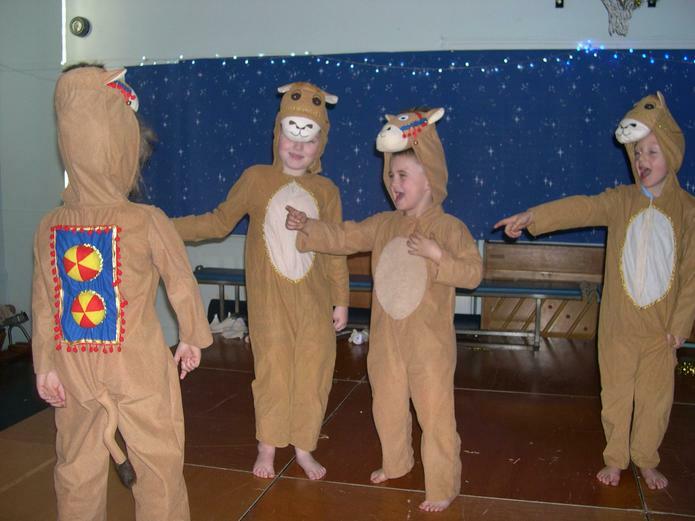 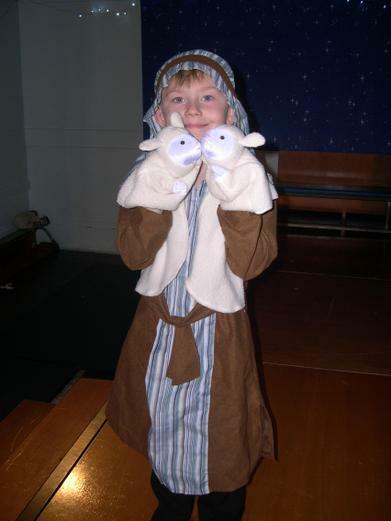 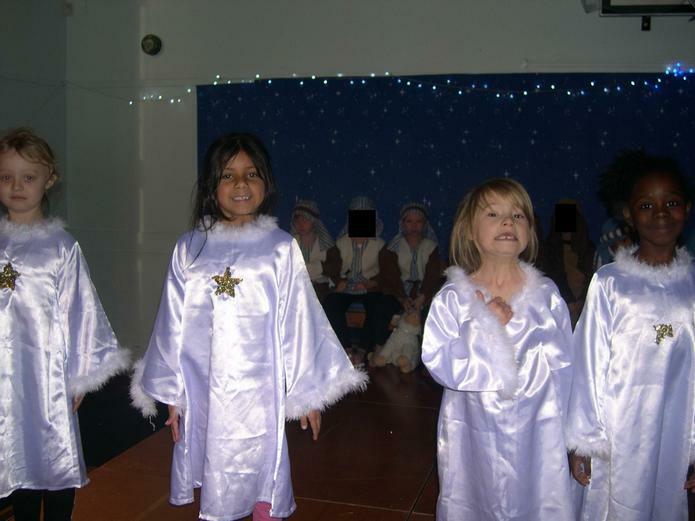 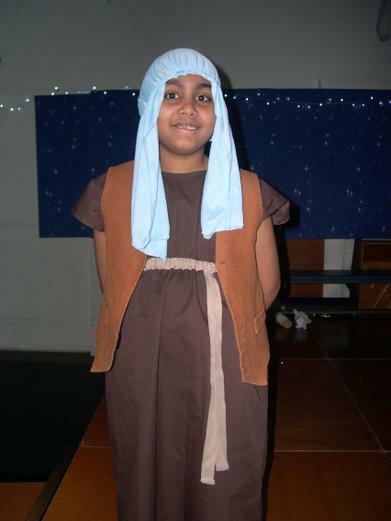 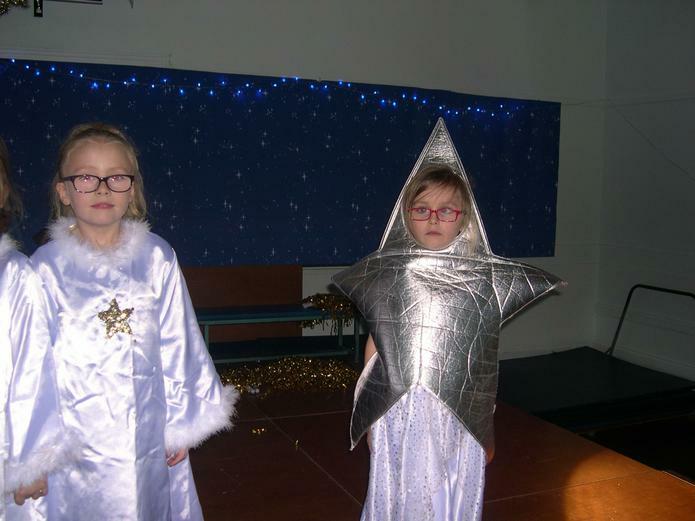 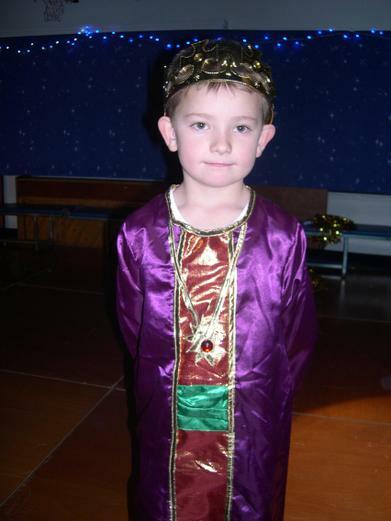 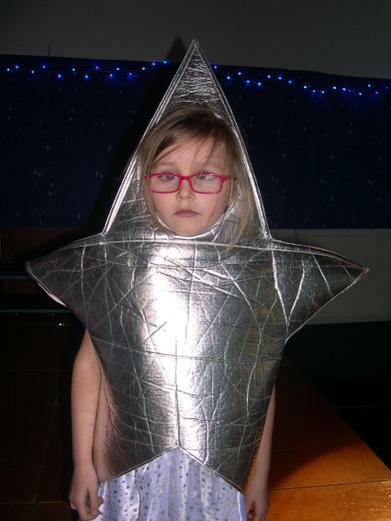 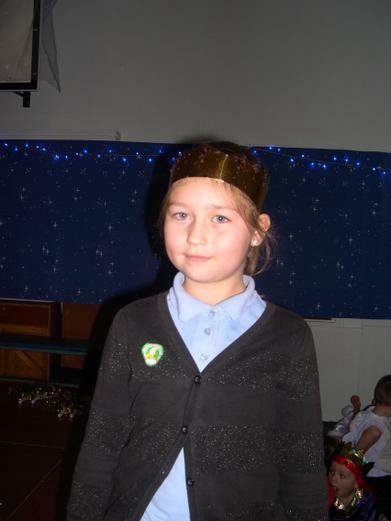 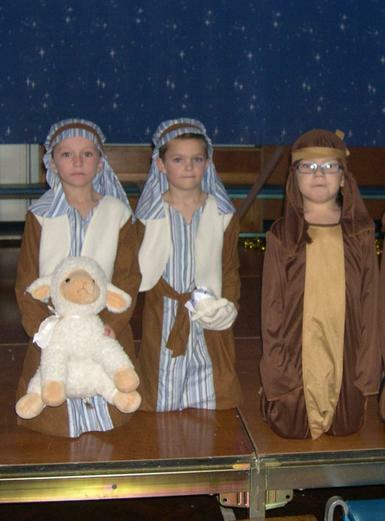 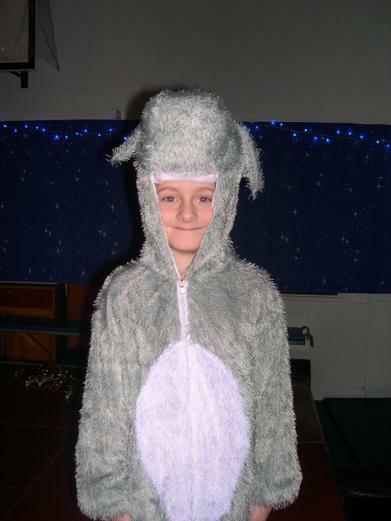 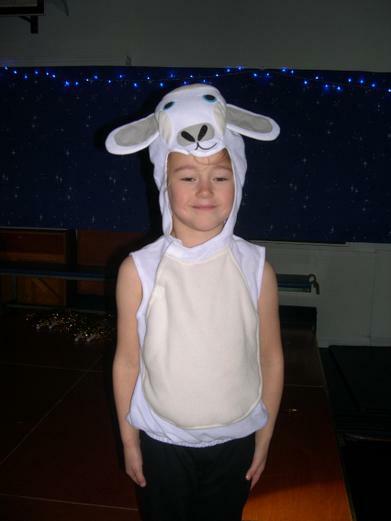 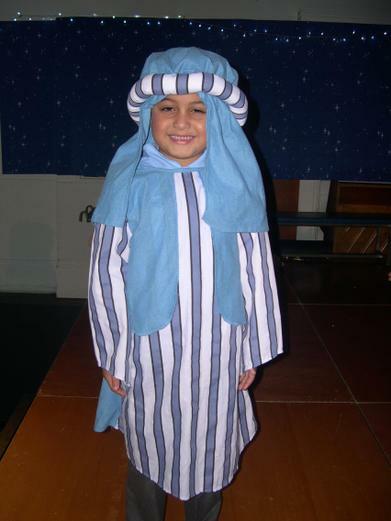 A big well done to all the children in KS1 for all their hard work in preparation for the Nativity and for their fantastic performances! 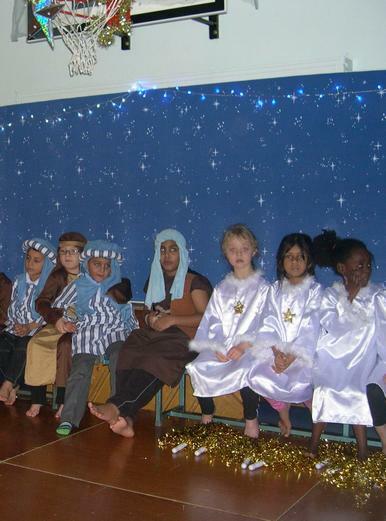 The Nativity will soon be here! 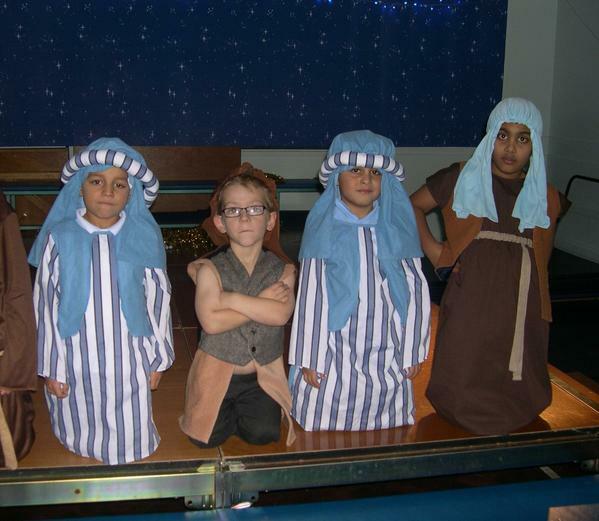 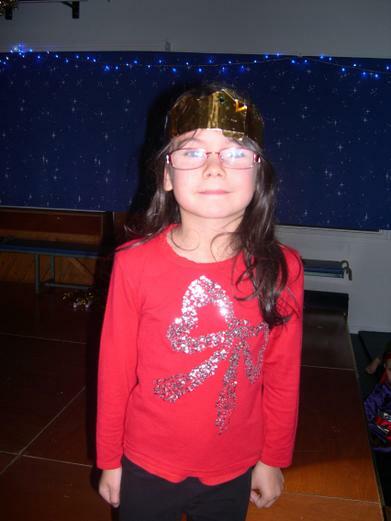 We are doing two performances on Tuesday 9th December and one on Wednesday 10th December. 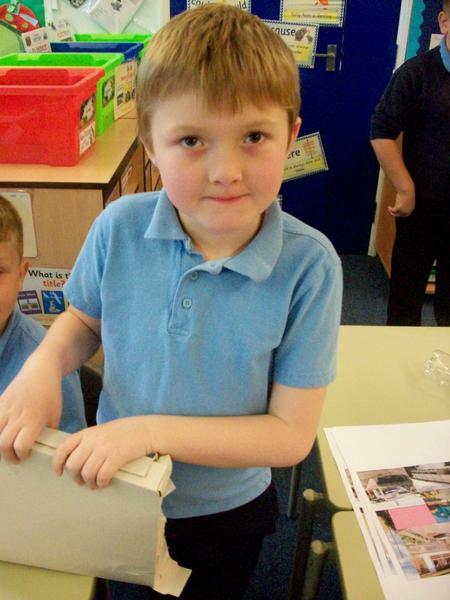 You can still get tickets from the office. 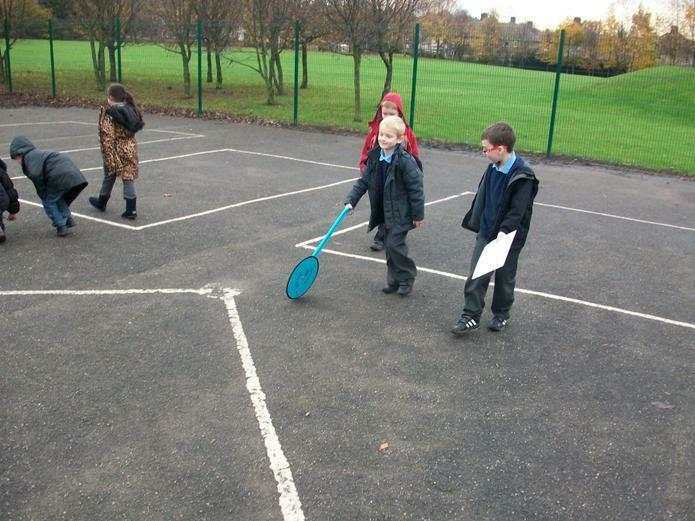 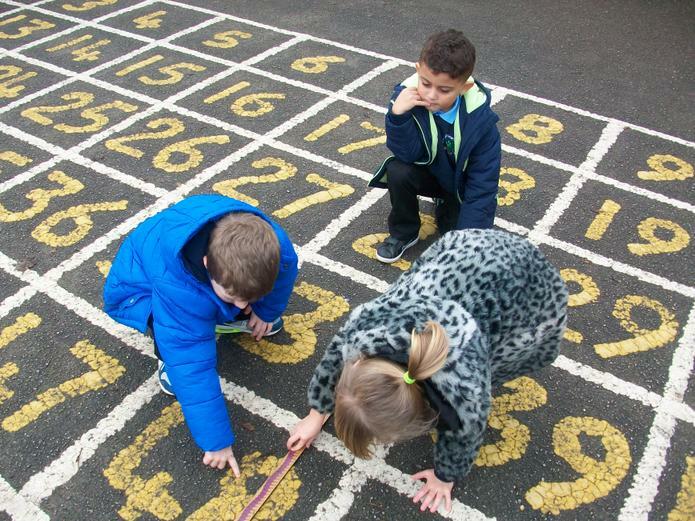 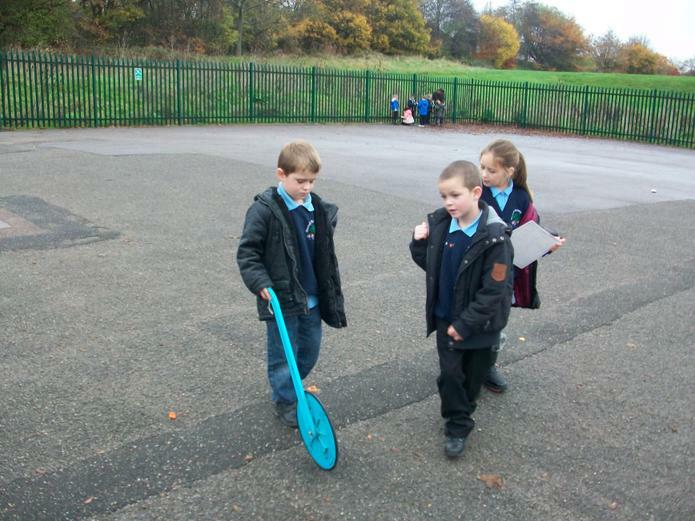 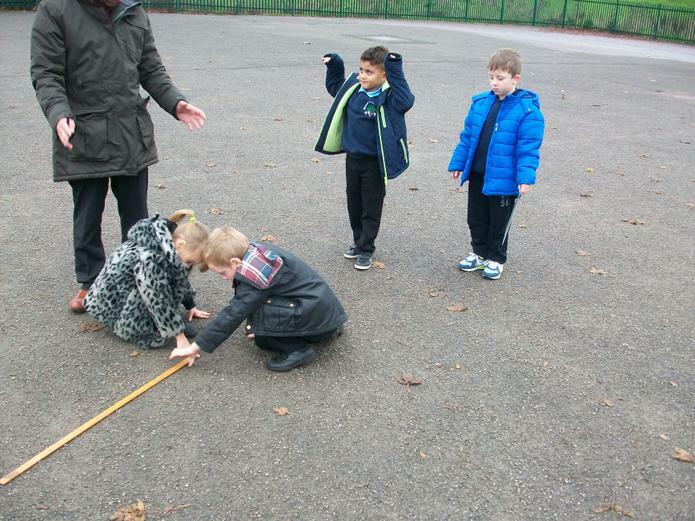 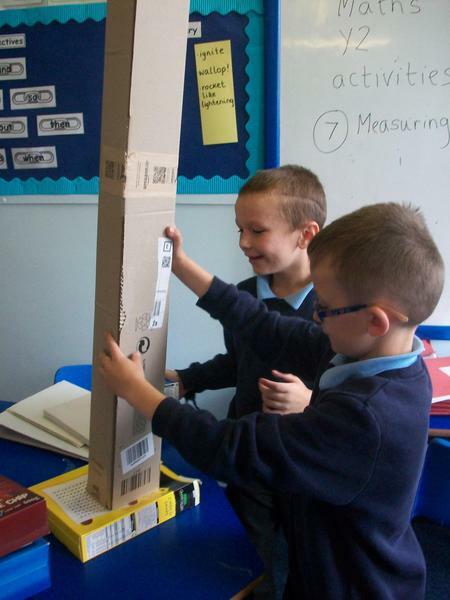 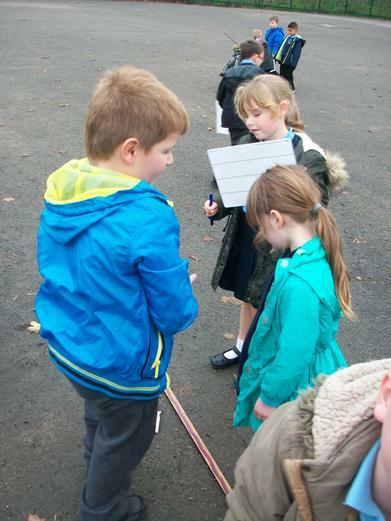 In Year 2, we have been doing some measuring in metres outside using trundle wheels and metre sticks. 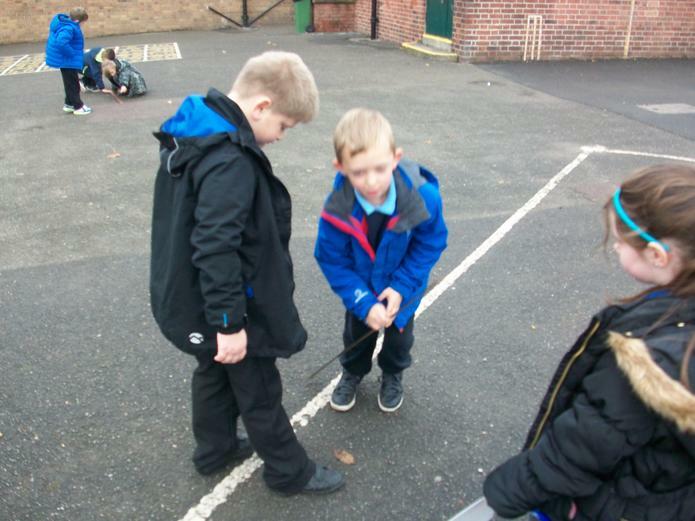 We have been measuring in centimetres and metres using the book Actual Size by Steve Jenkins. 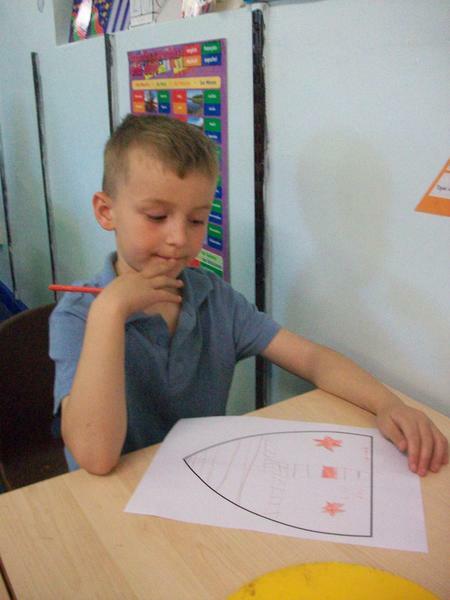 Did you know a crocodile's head is 72 cm long? 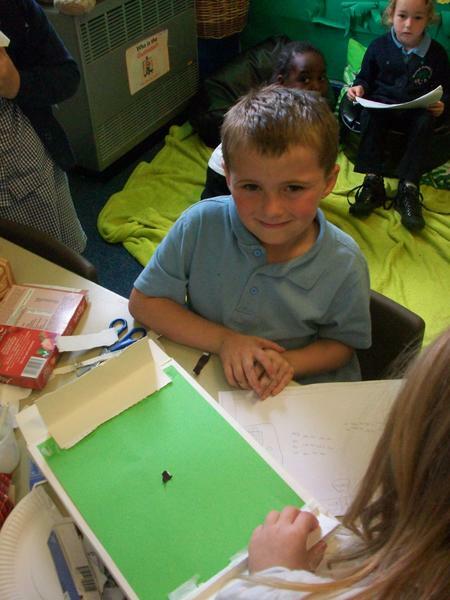 Look how big the spider is! 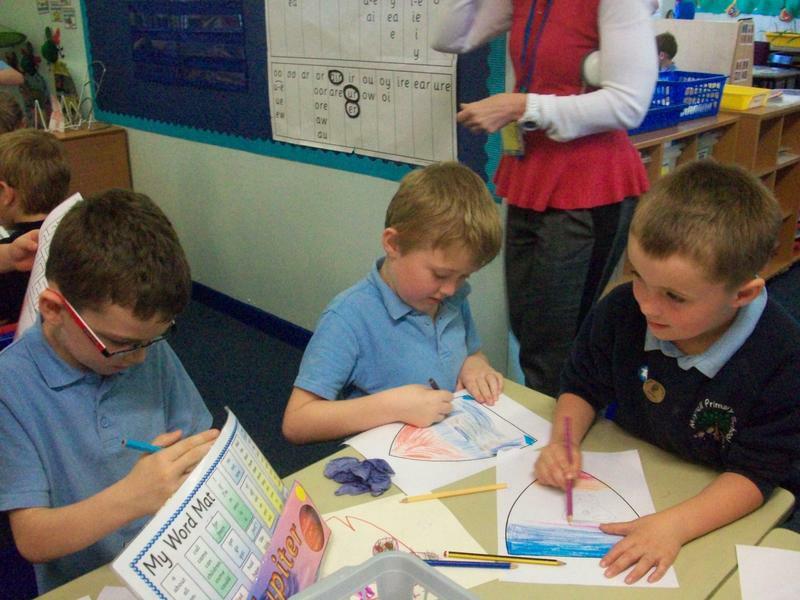 In literacy, we have been doing work around the fairy tale Cinderella. 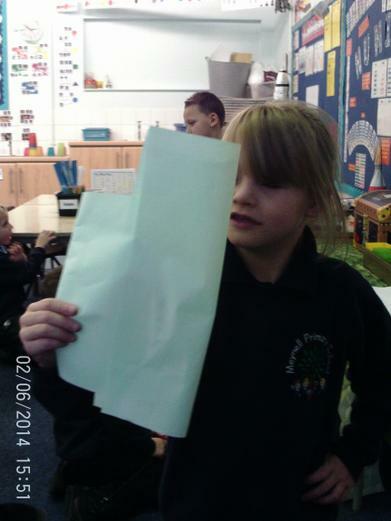 These photos were taken when we acted out the story. 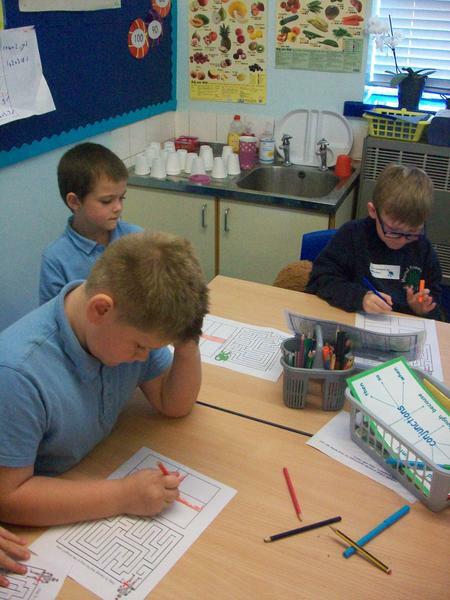 We have been using Numicon to support our learning in maths. 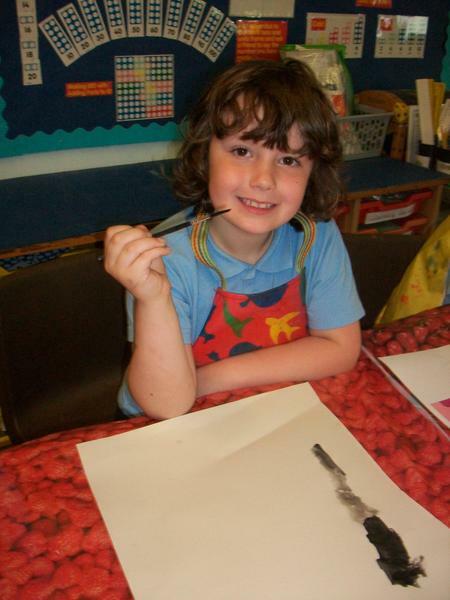 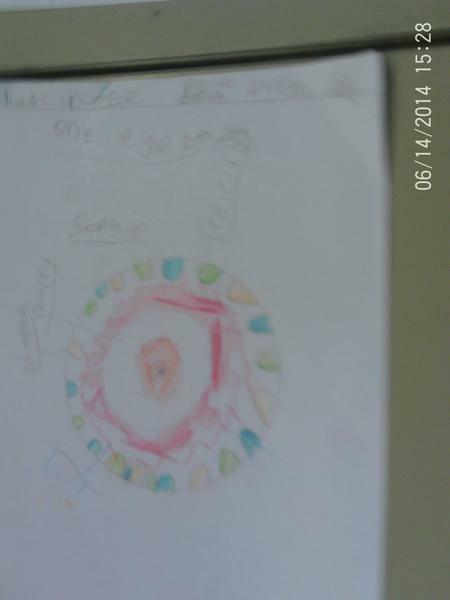 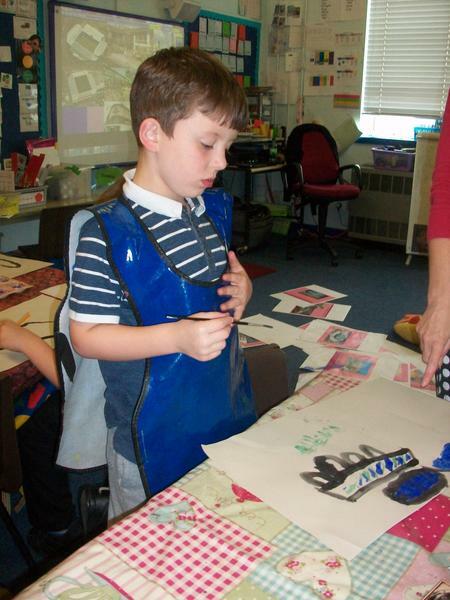 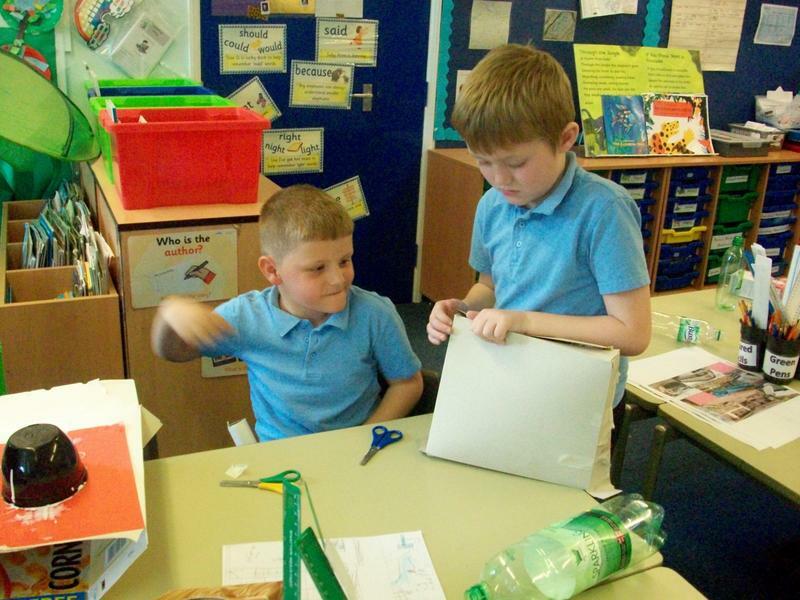 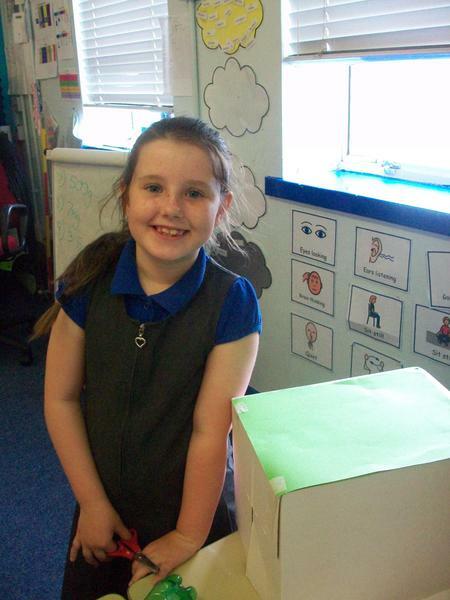 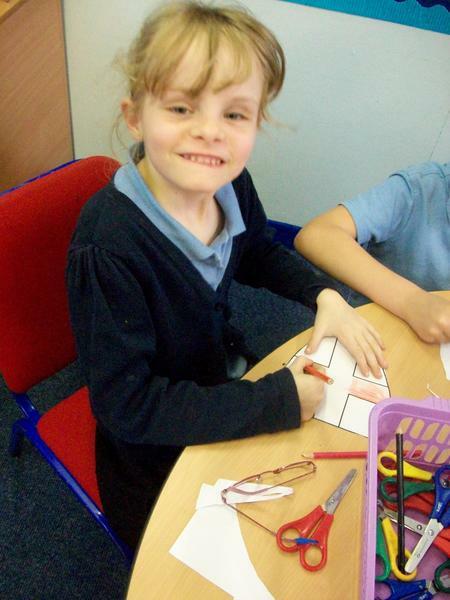 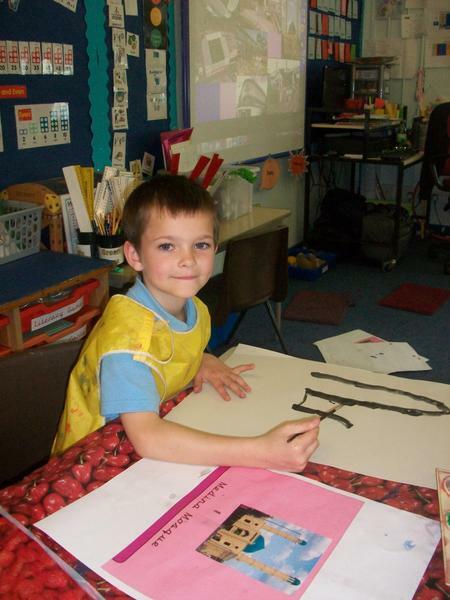 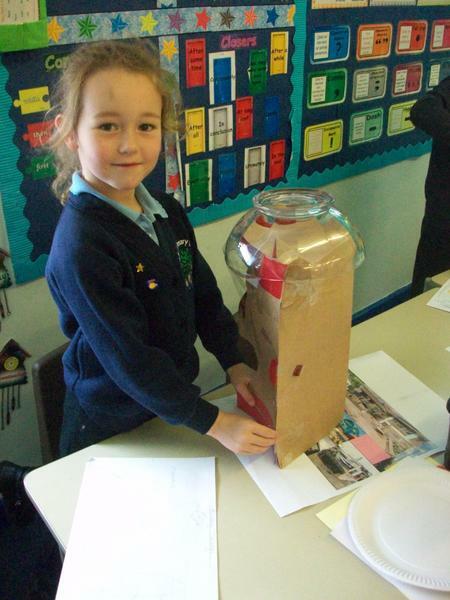 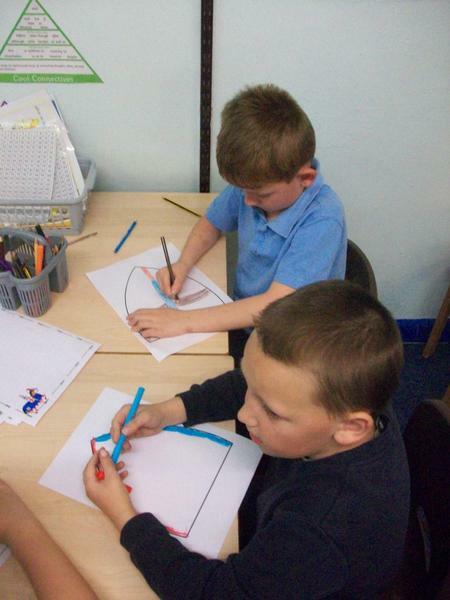 In Y2, we have been looking at Neil Armstrong and we are currently making a non-fiction space book. 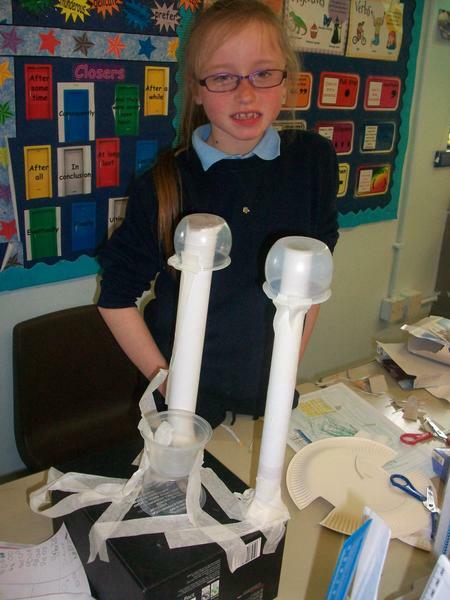 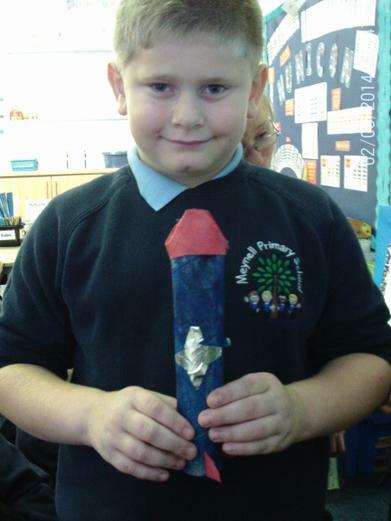 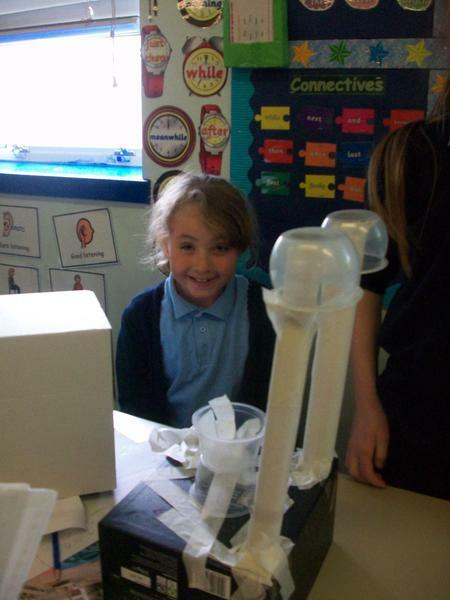 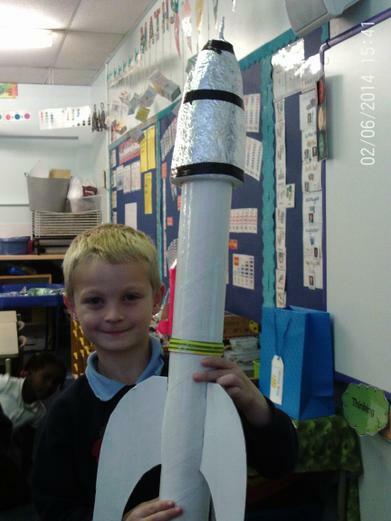 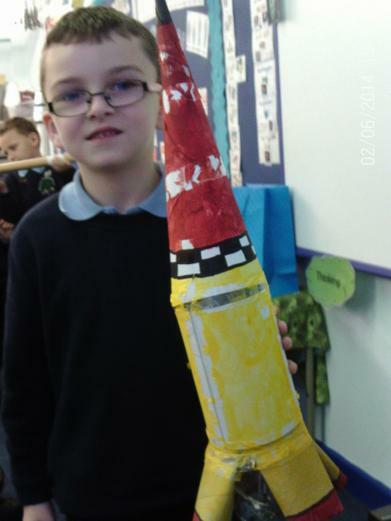 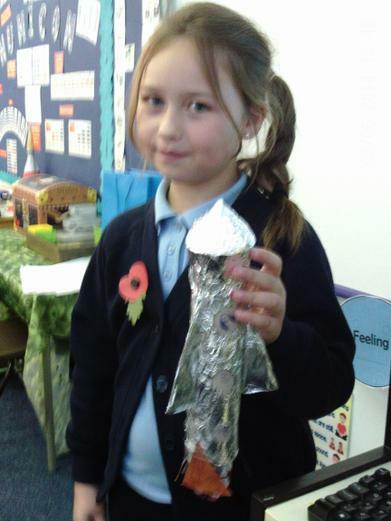 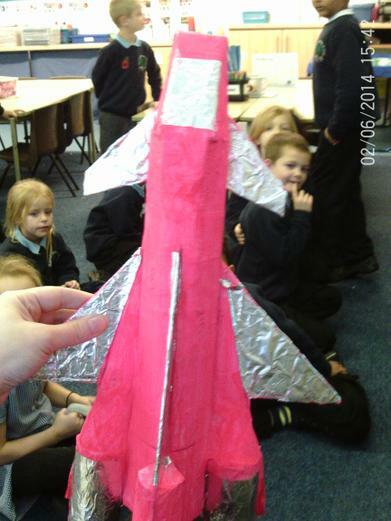 Also, we have made some fantastic rockets! 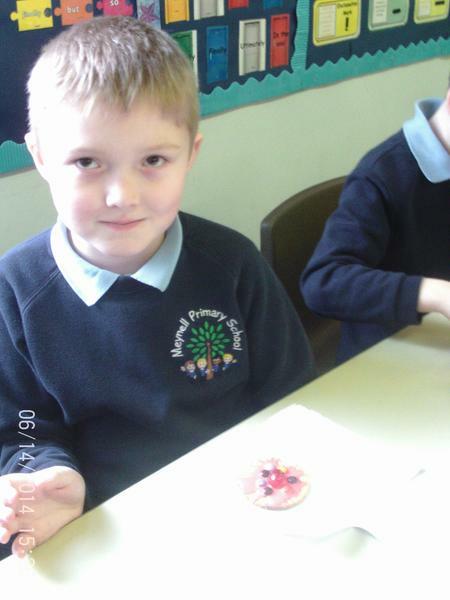 We made poppies for Remembrance Day and had some thinking time activities. 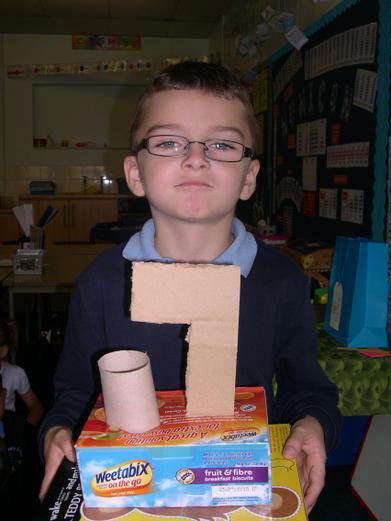 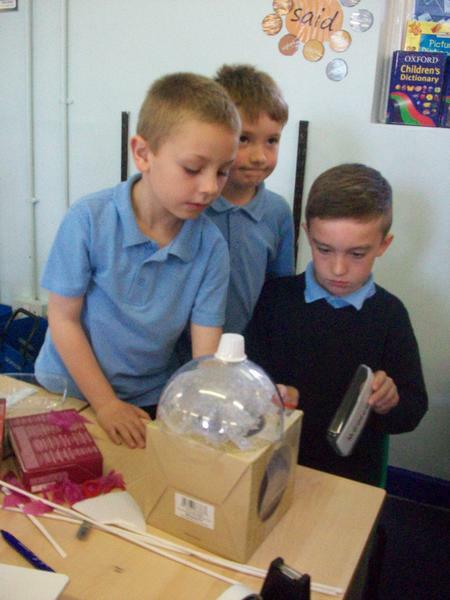 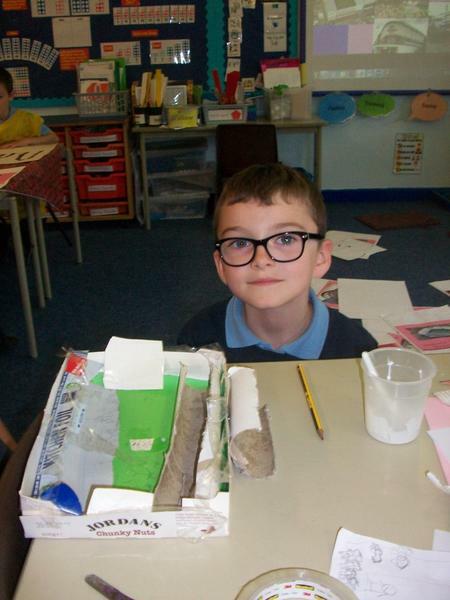 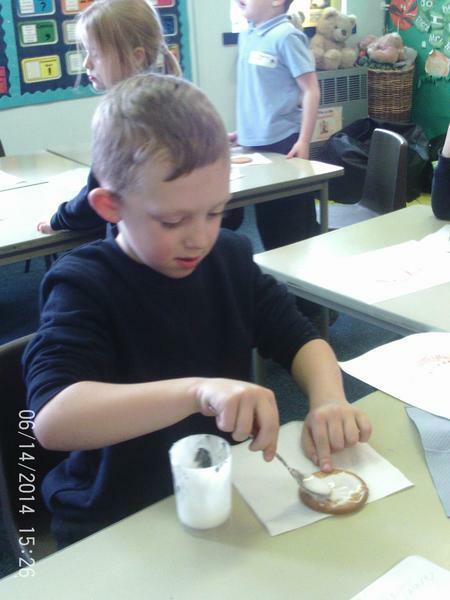 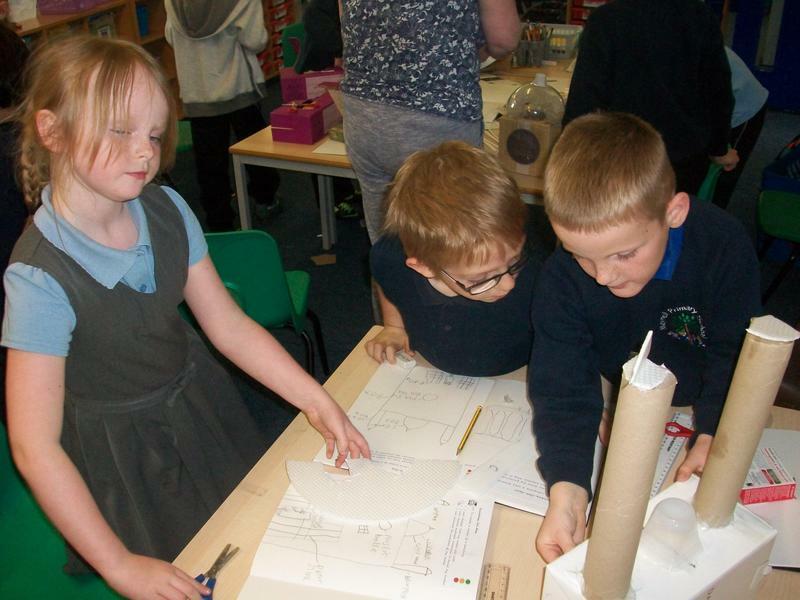 In science, we have been looking at how materials change. 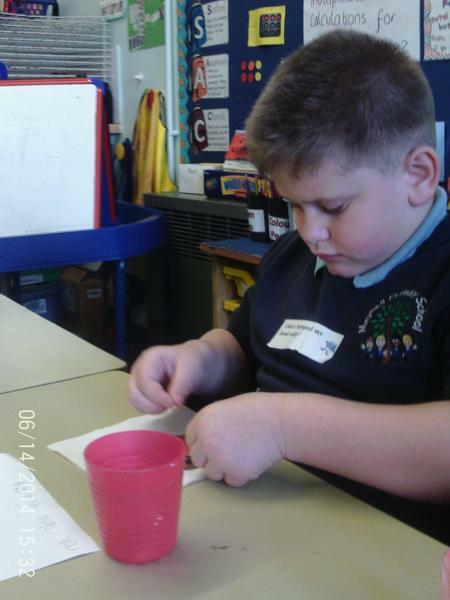 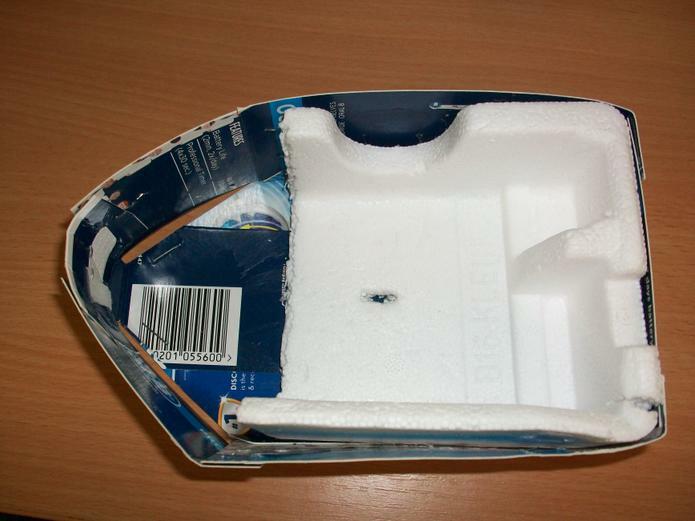 These photos show a few of the investigations we have done. 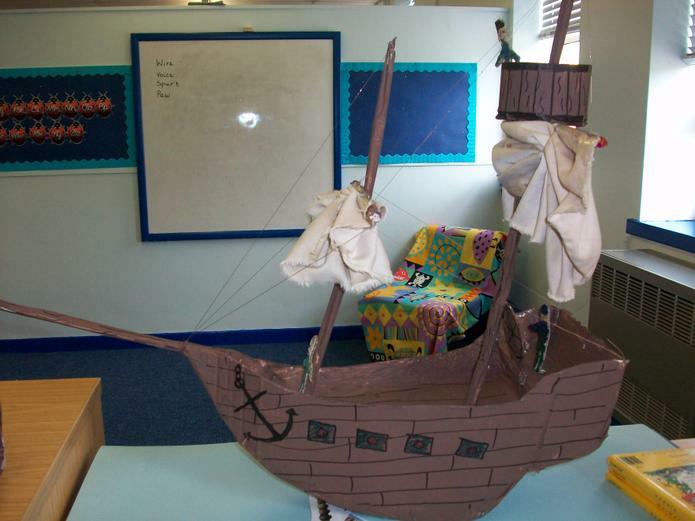 We have looked at Christopher Columbus and his three ships, The Pinta, Santa Maria and The Nina. 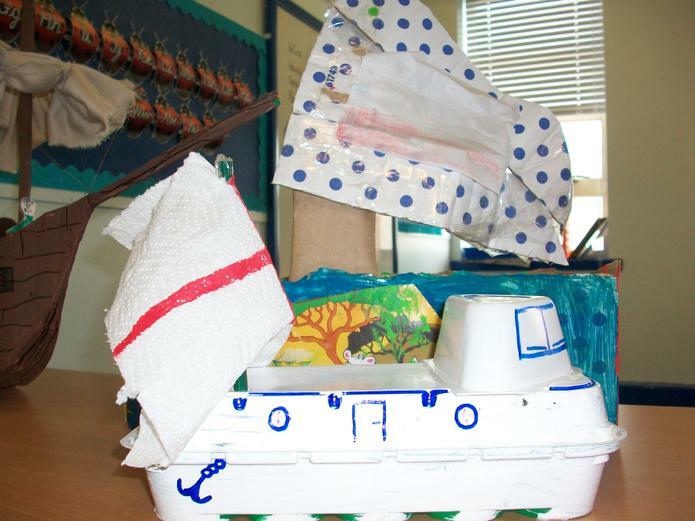 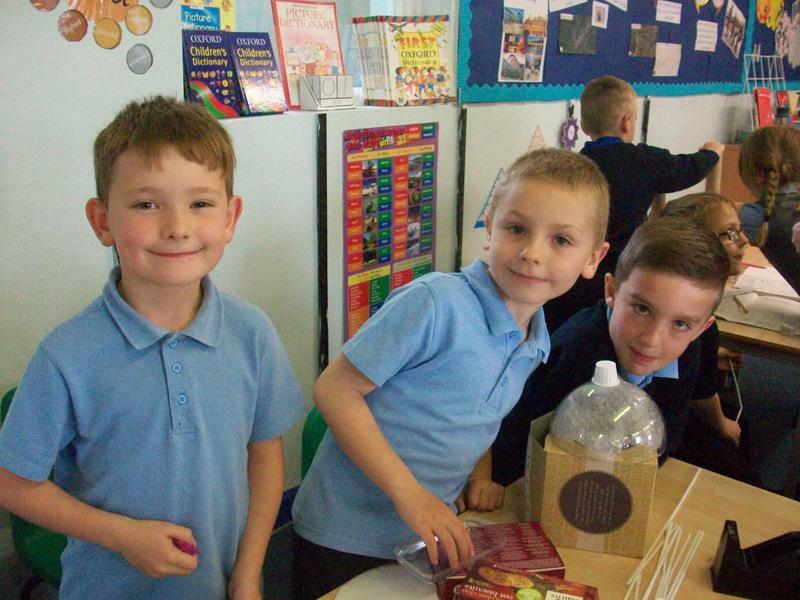 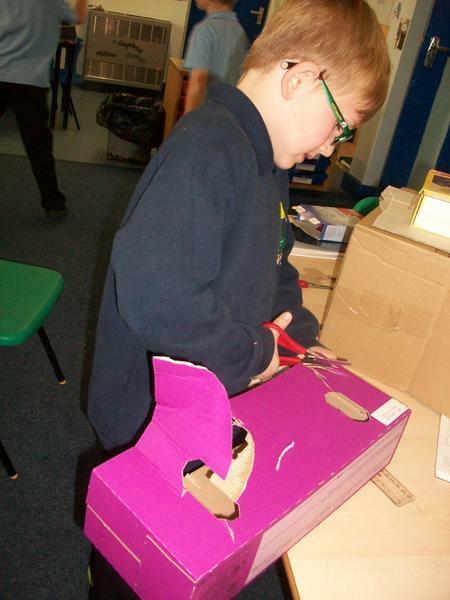 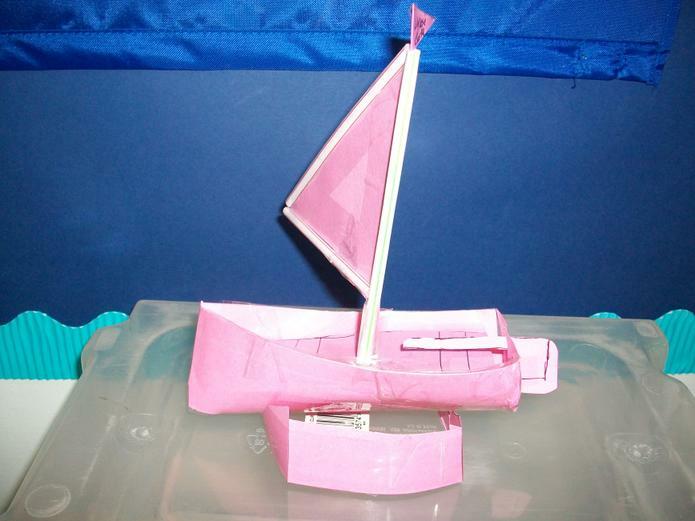 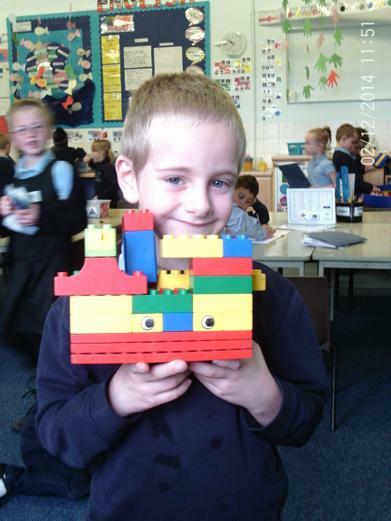 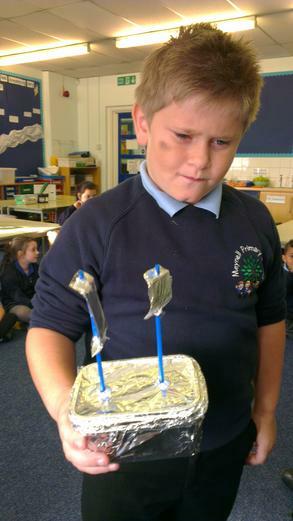 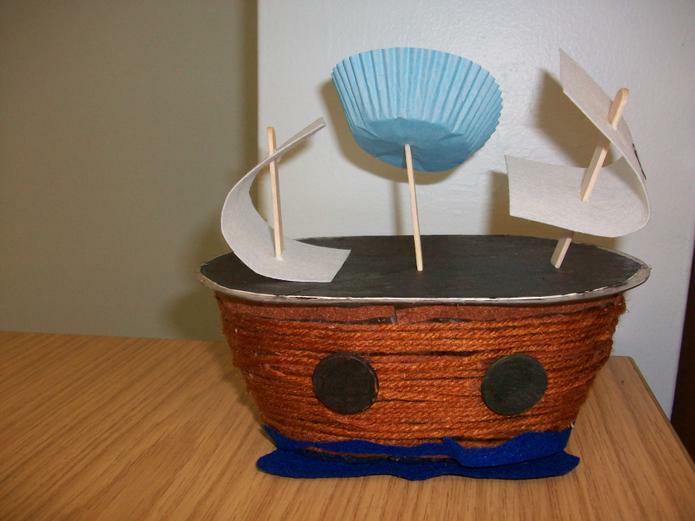 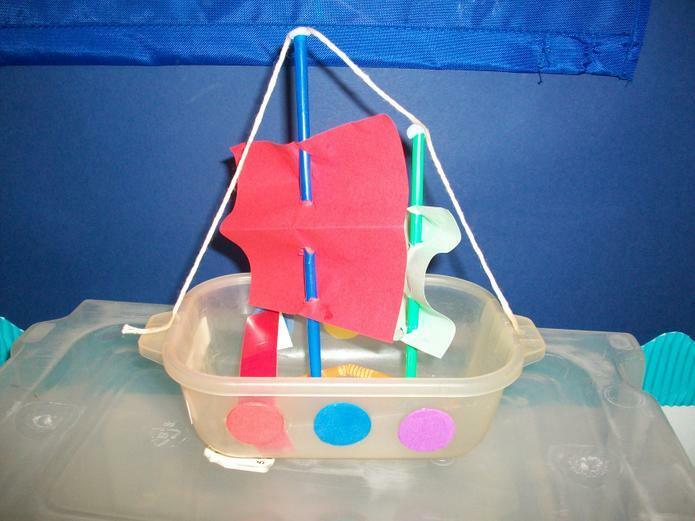 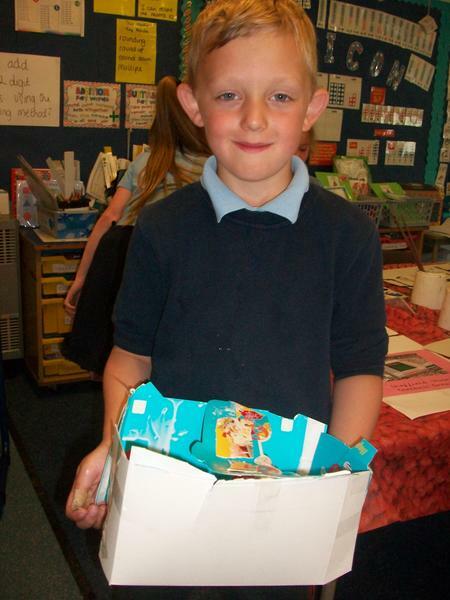 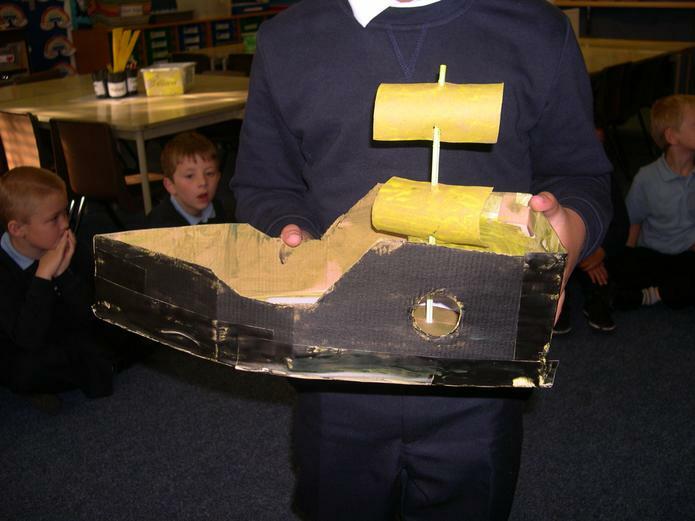 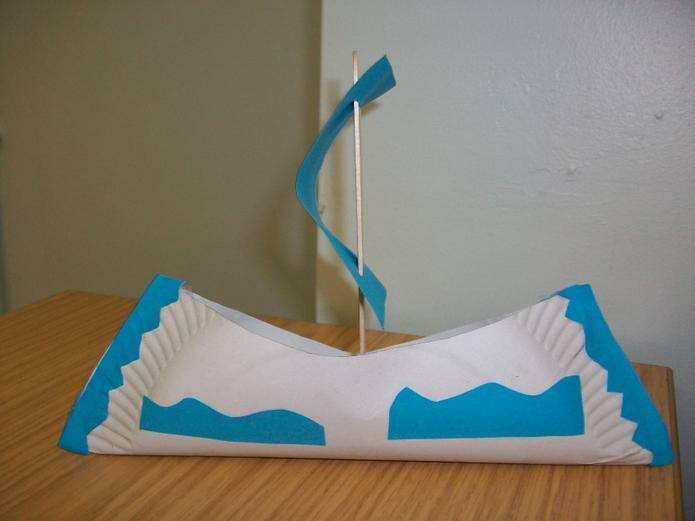 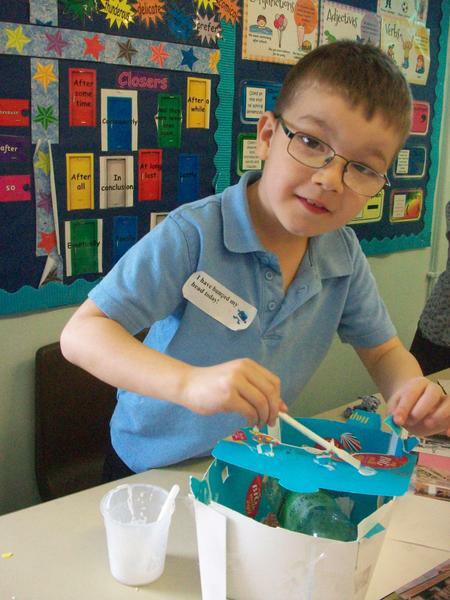 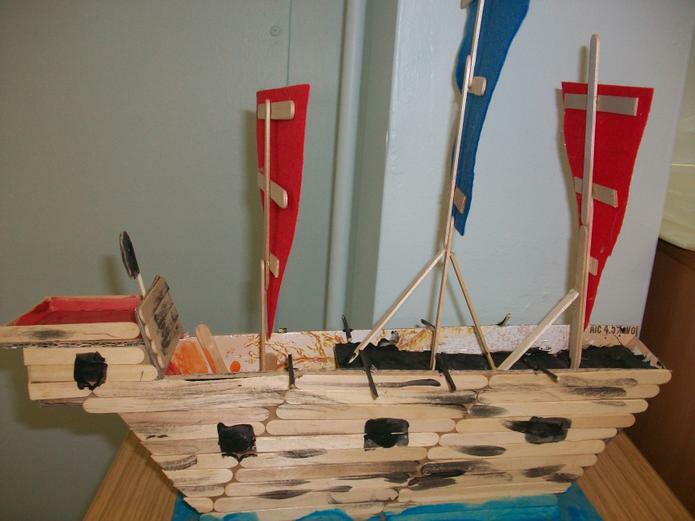 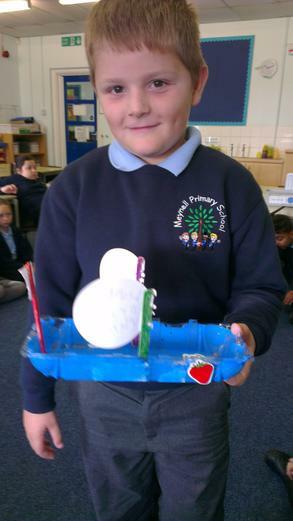 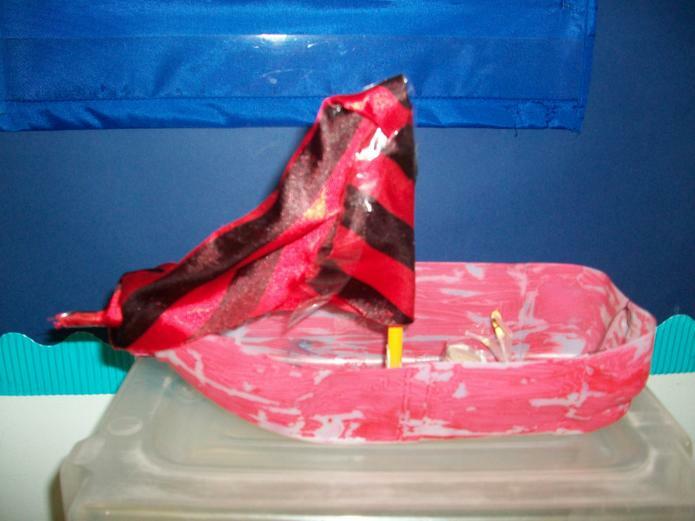 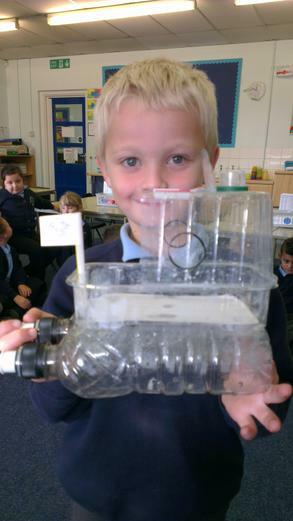 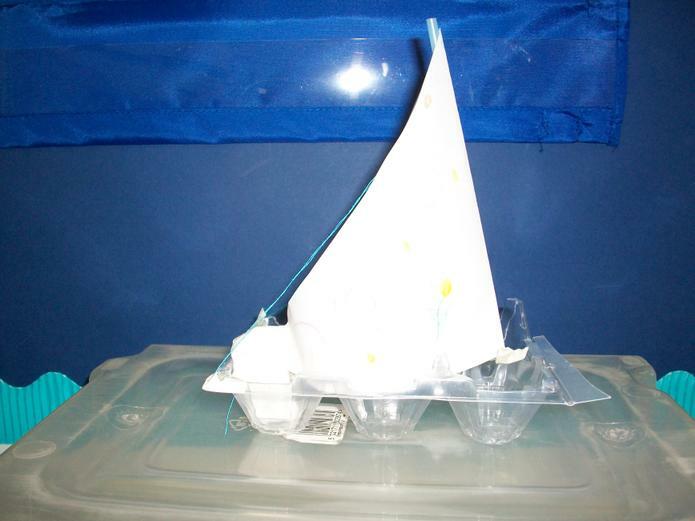 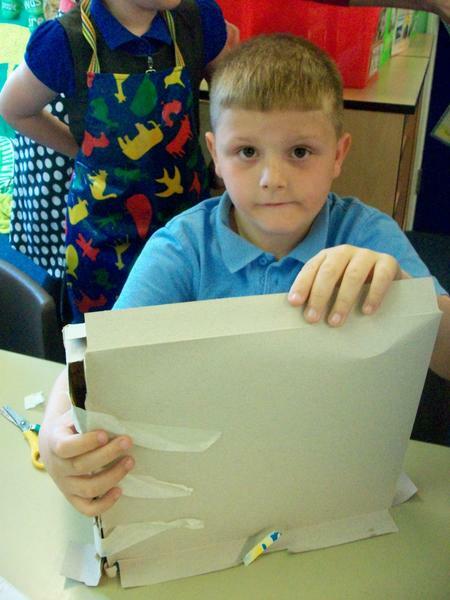 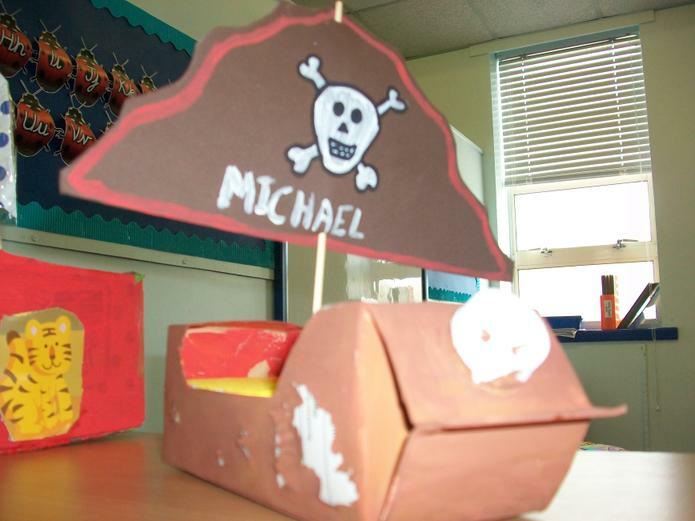 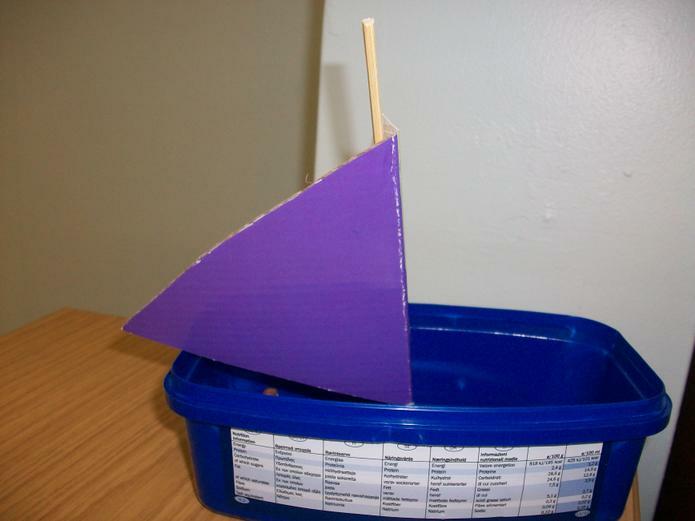 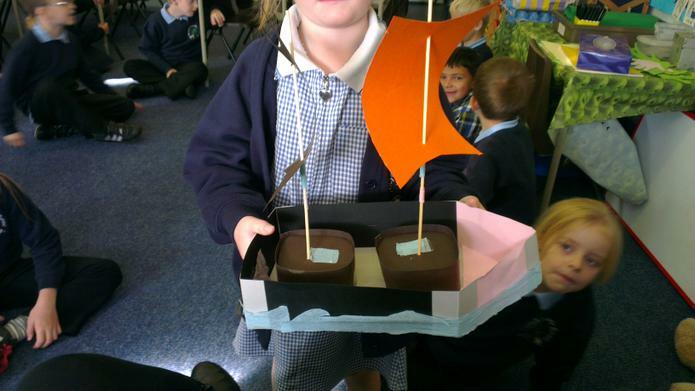 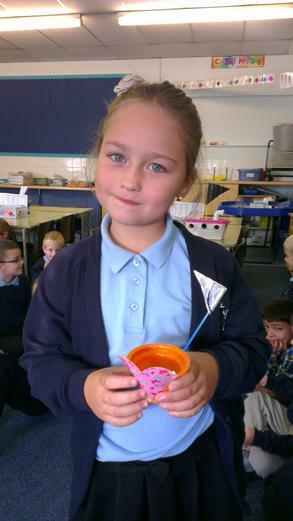 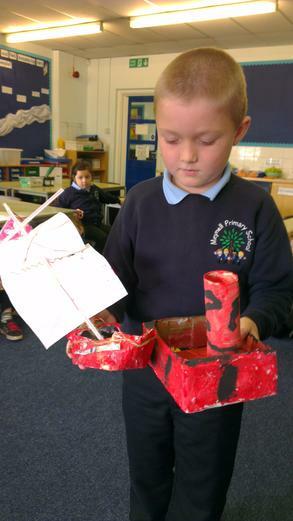 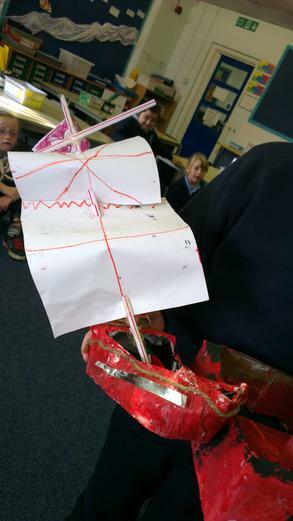 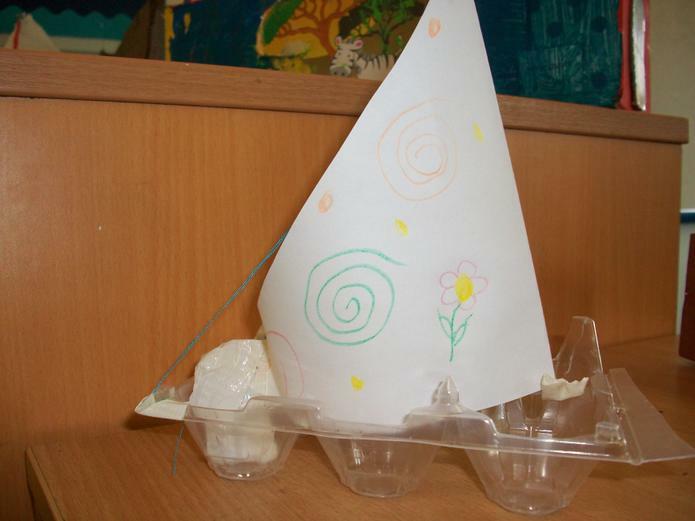 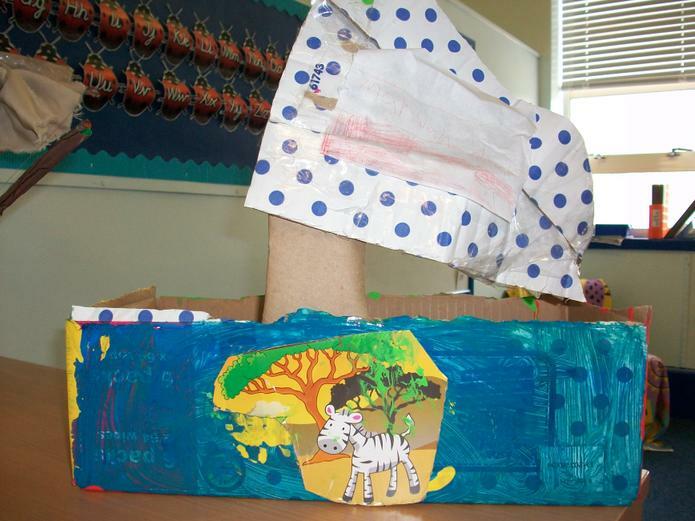 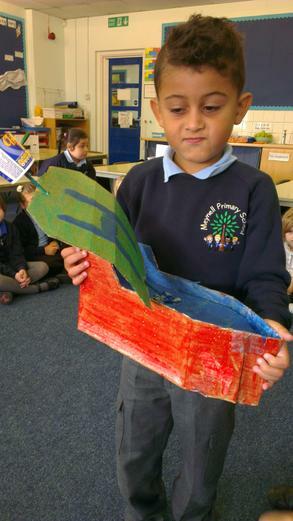 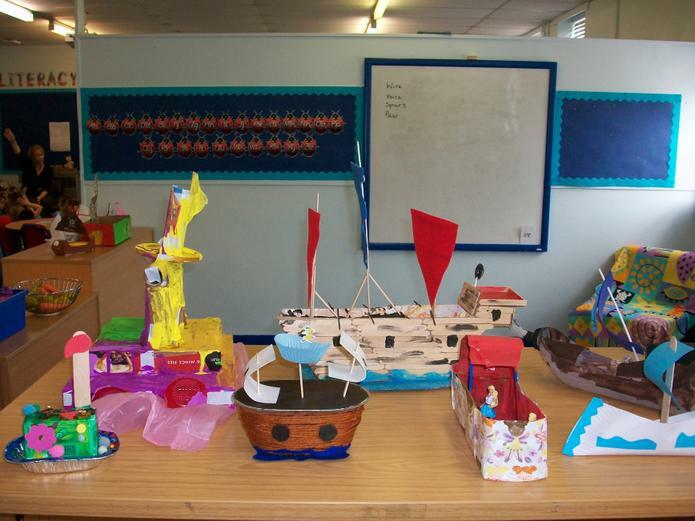 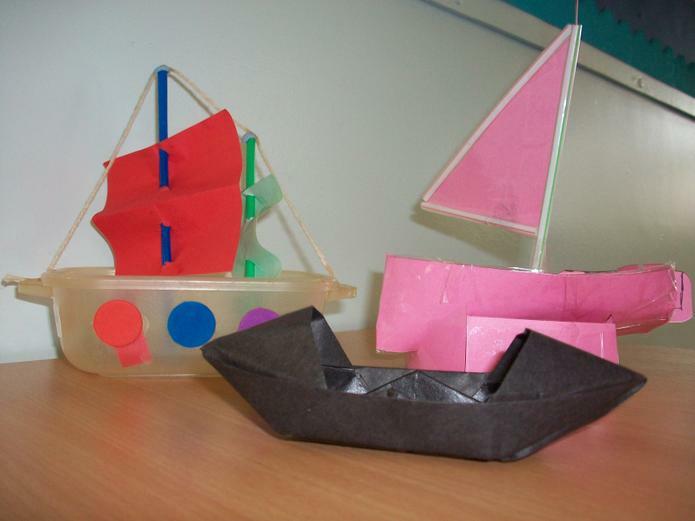 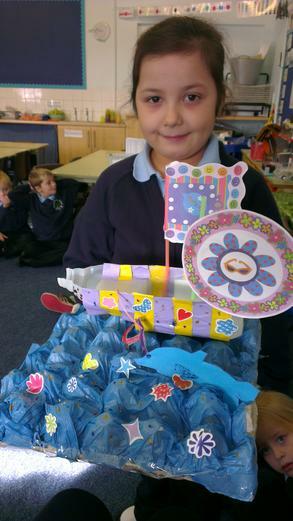 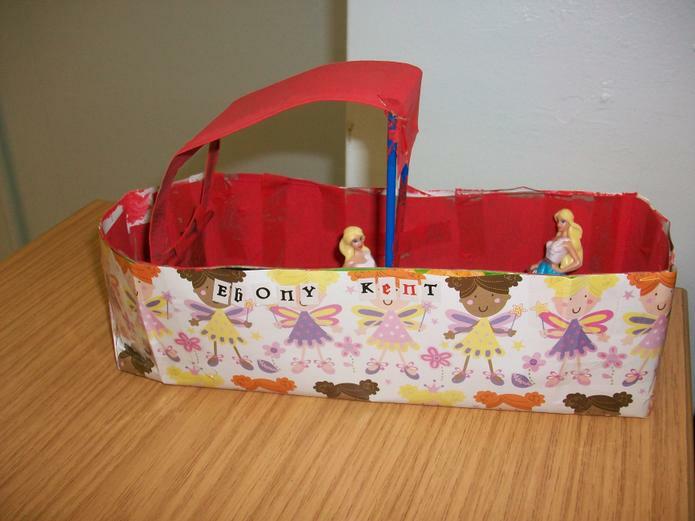 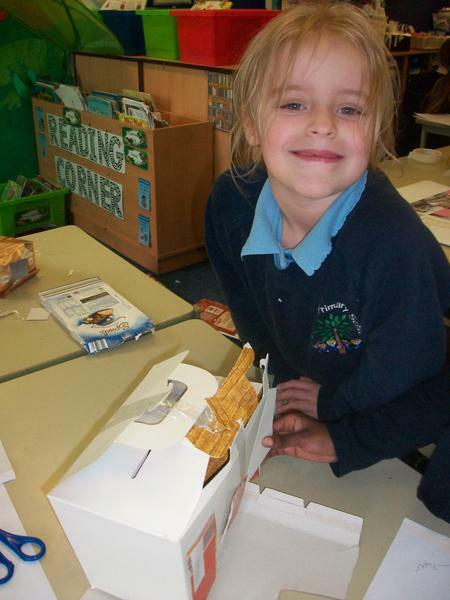 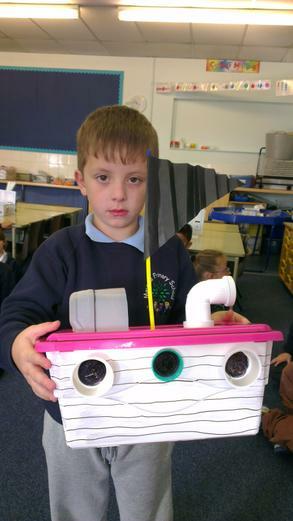 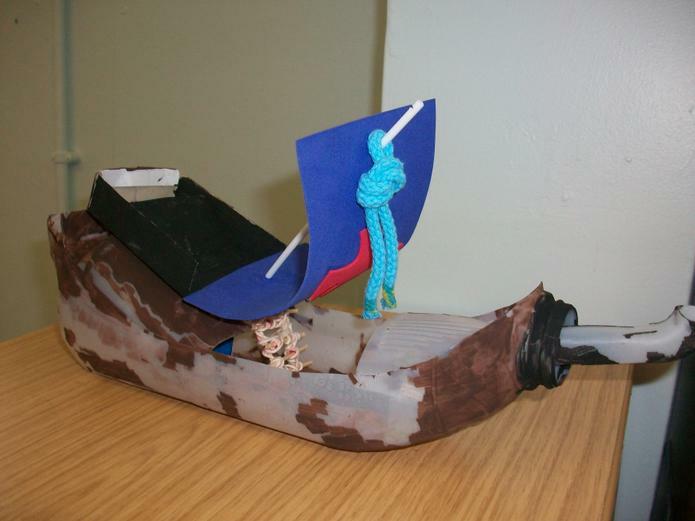 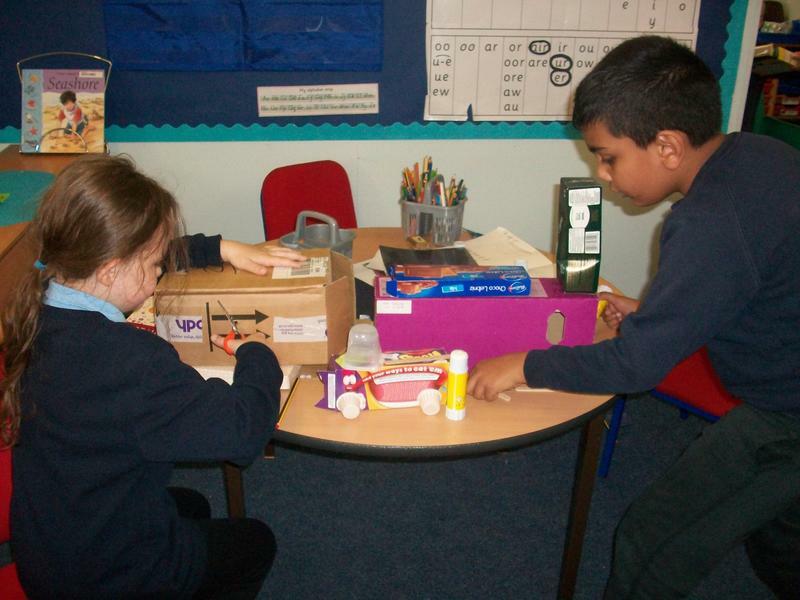 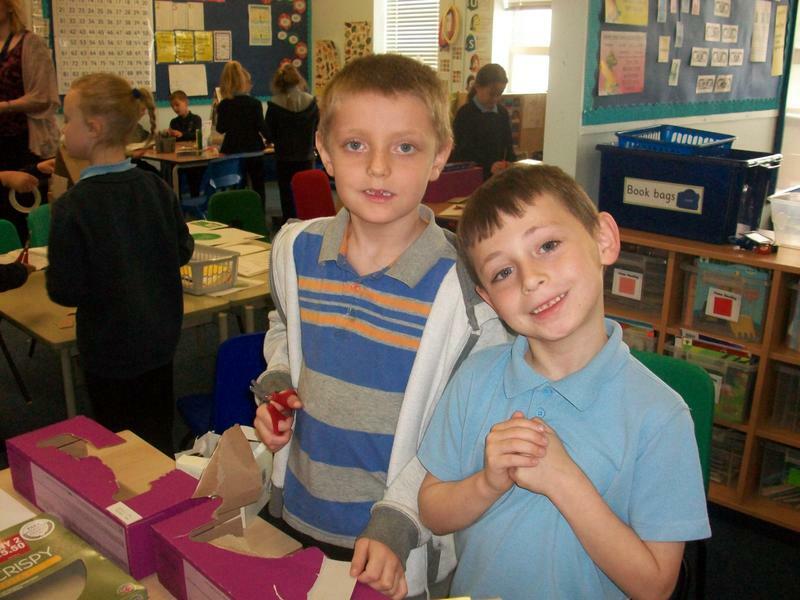 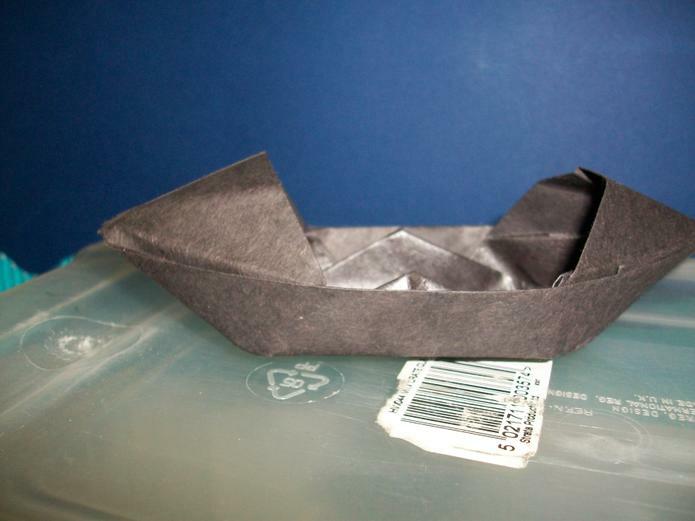 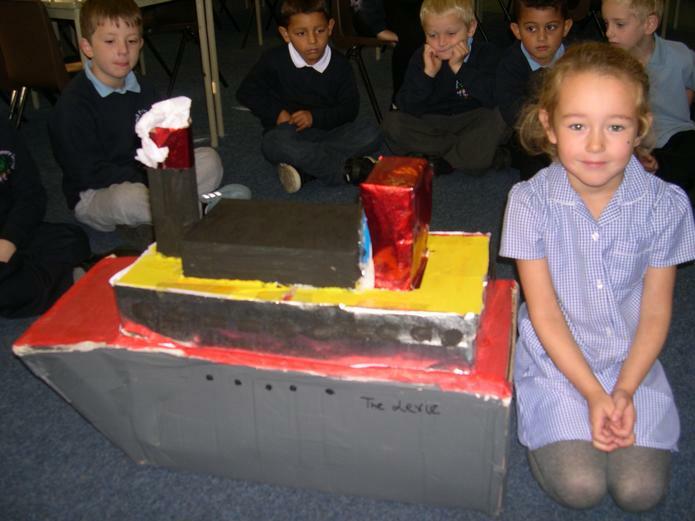 We even made our own model ships! 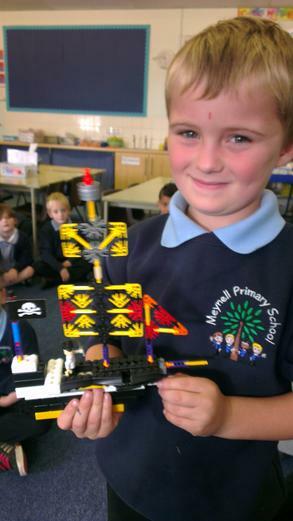 Why were Christopher Columbus and Neil Armstrong very brave people?